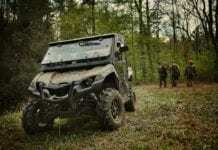 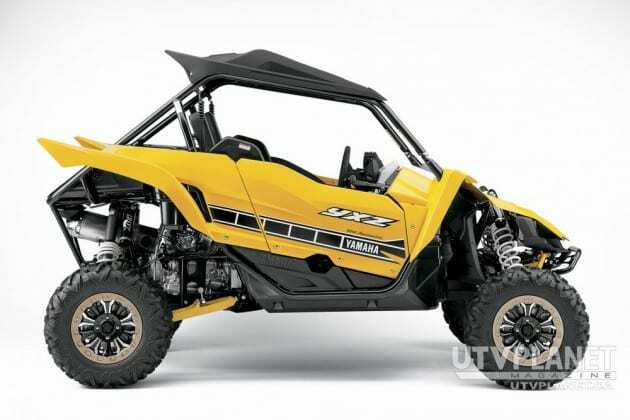 Sept 1, 2015 (Toronto, ON via Kennesaw, GA) – Yamaha Motor Canada Ltd. introduces the all-new YXZ1000R, the world’s only pure sport Side-by-Side (SxS) vehicle. 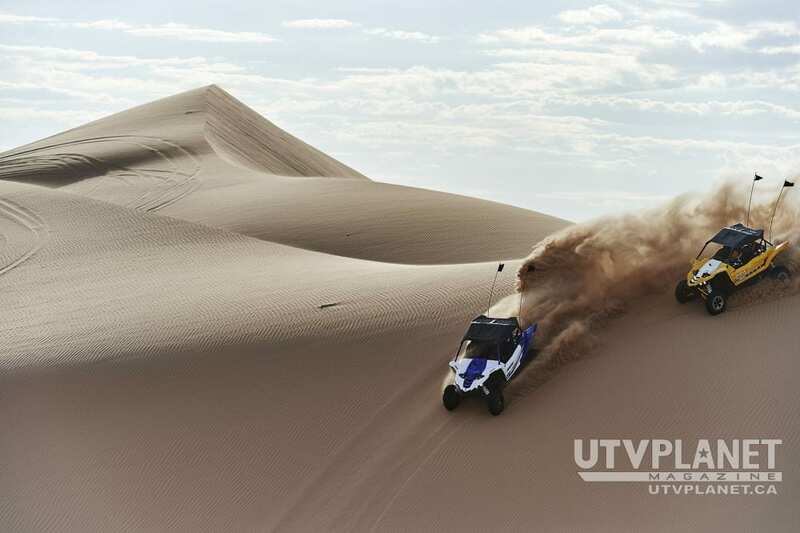 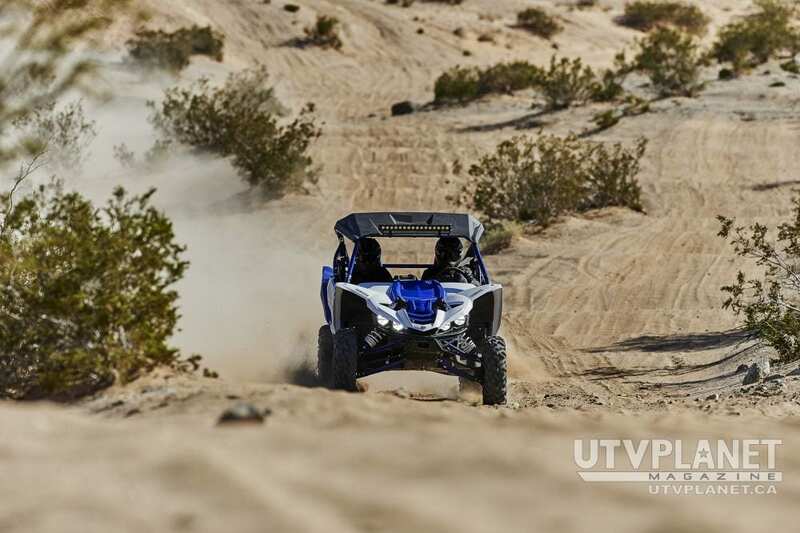 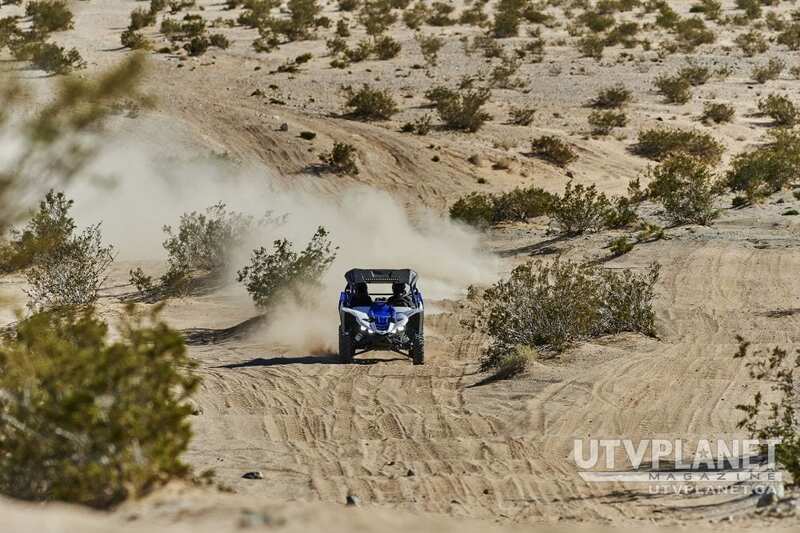 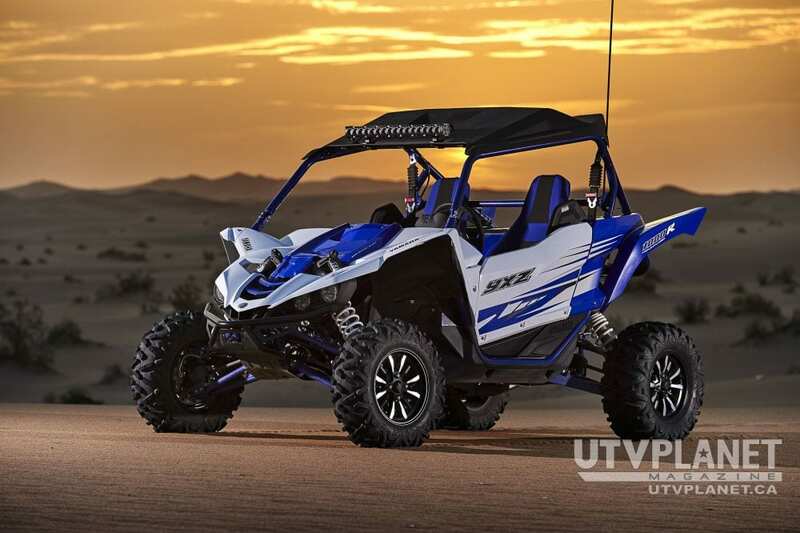 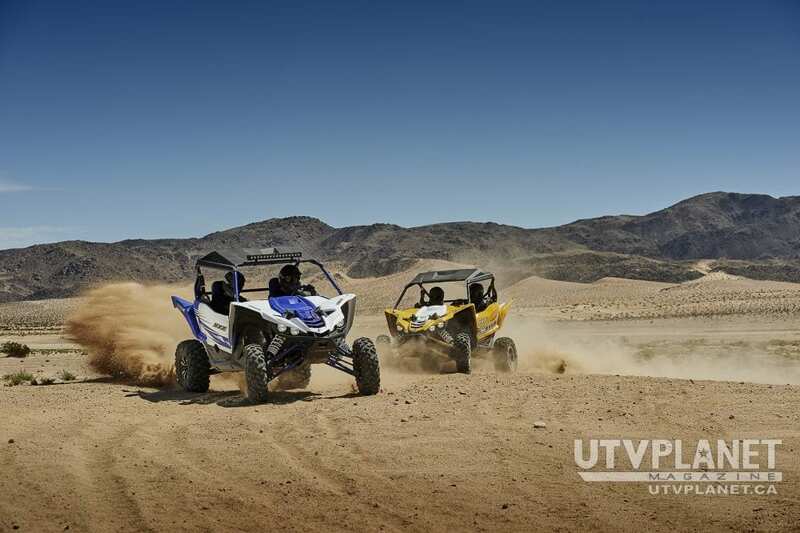 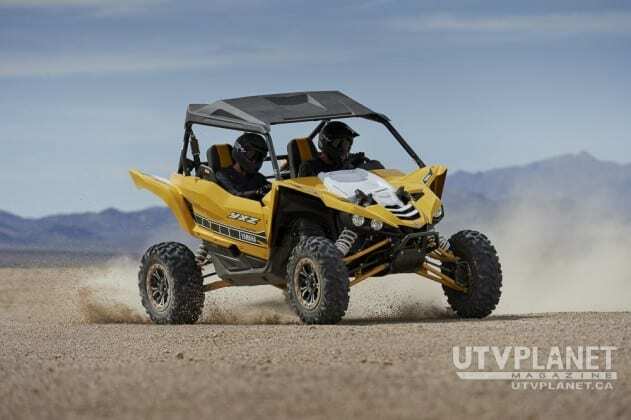 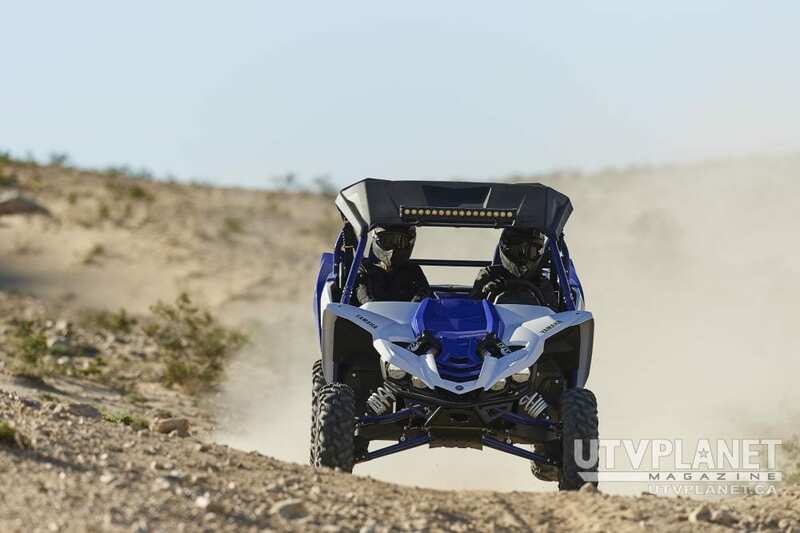 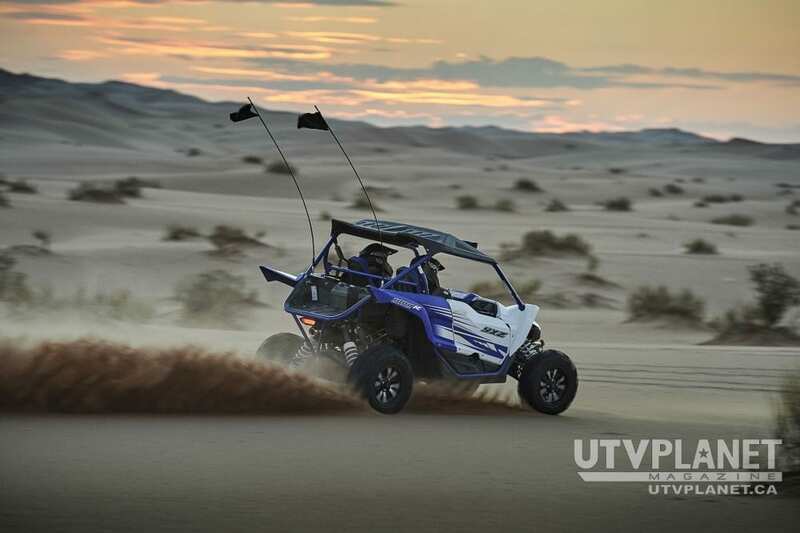 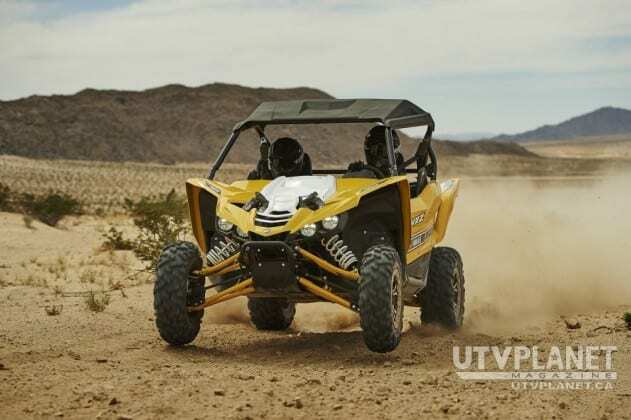 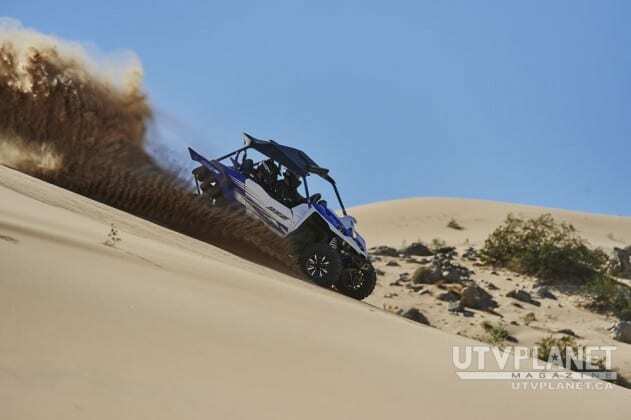 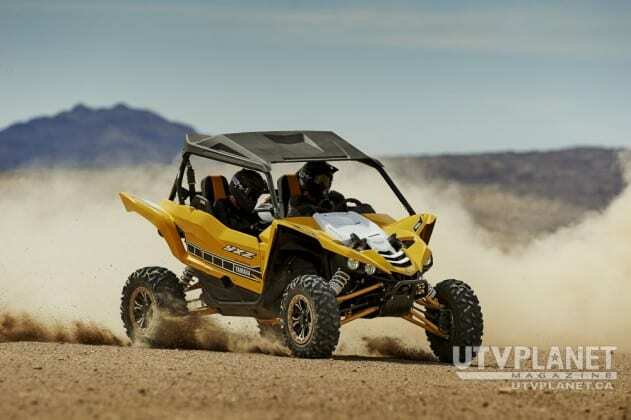 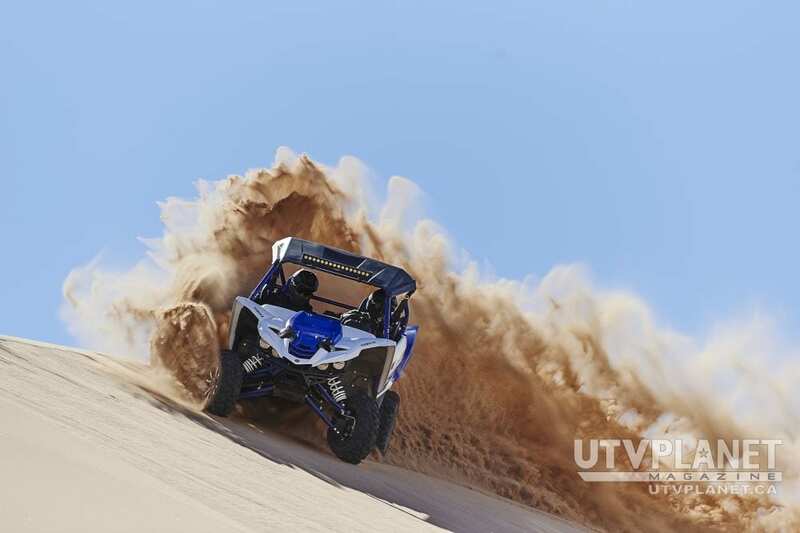 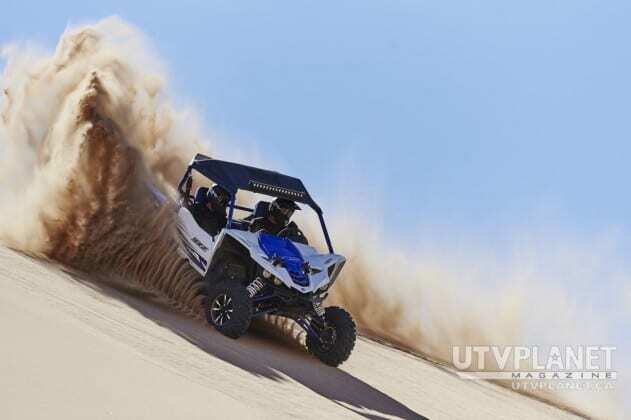 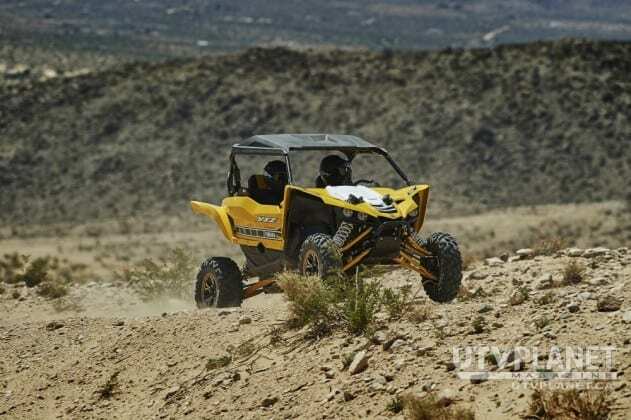 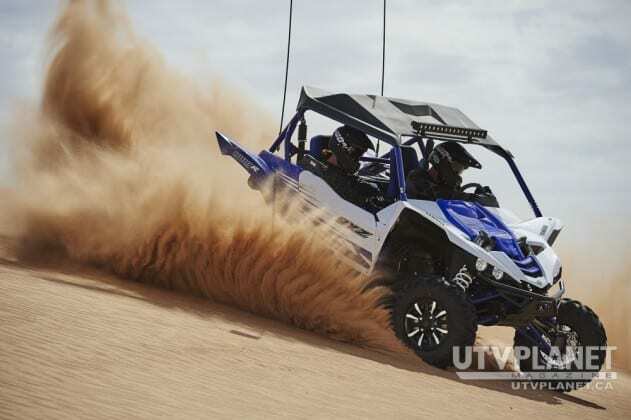 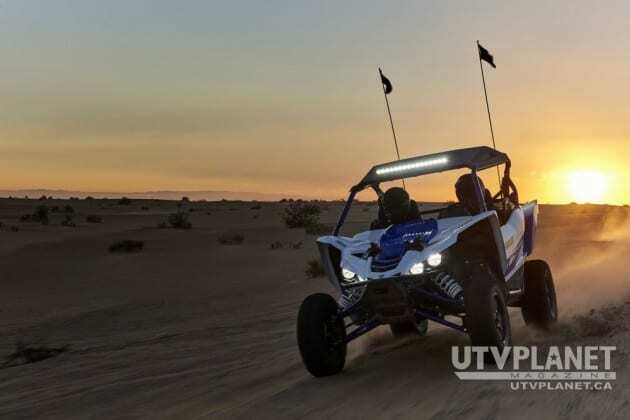 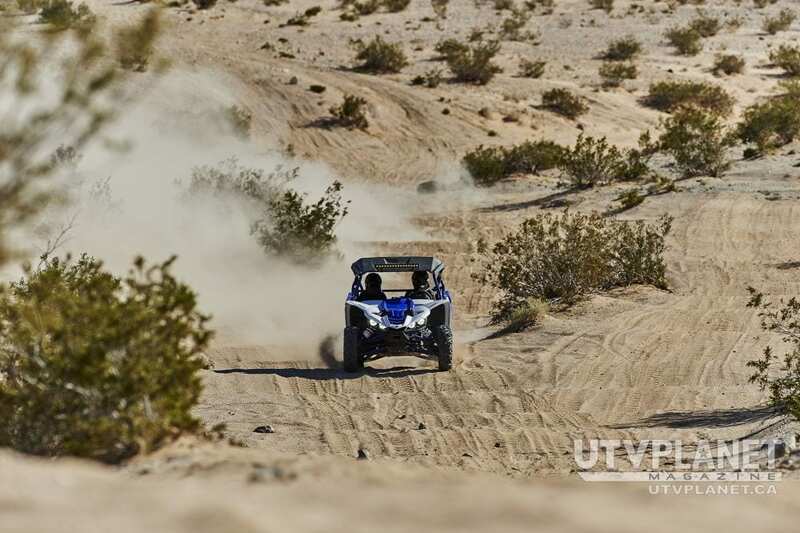 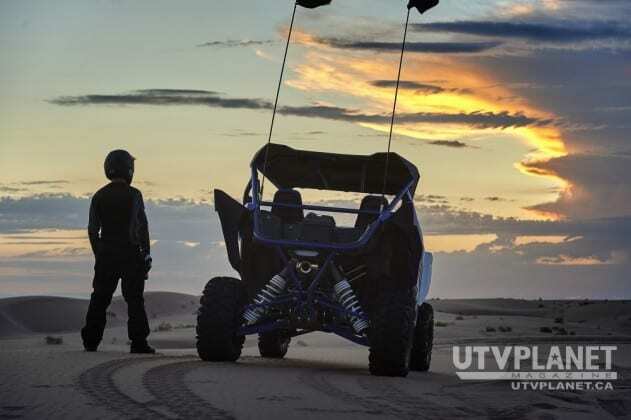 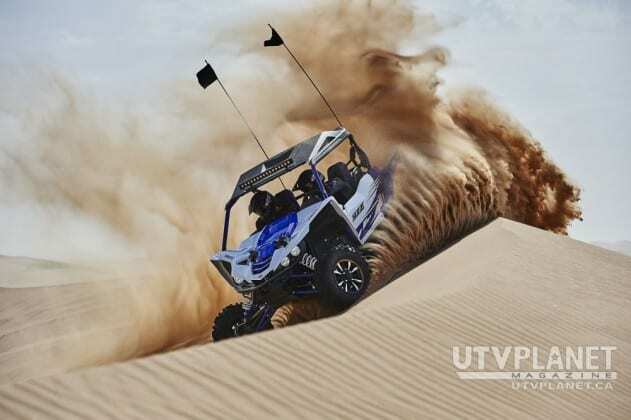 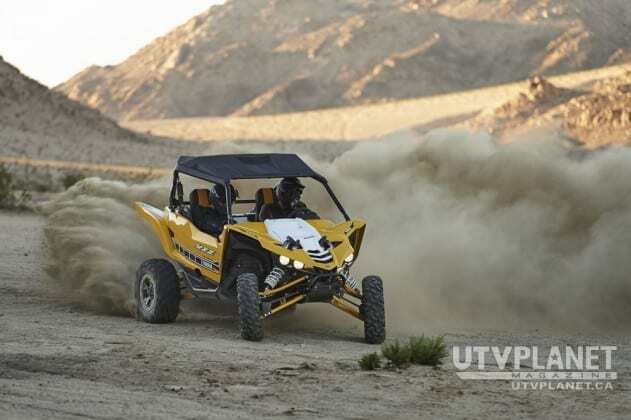 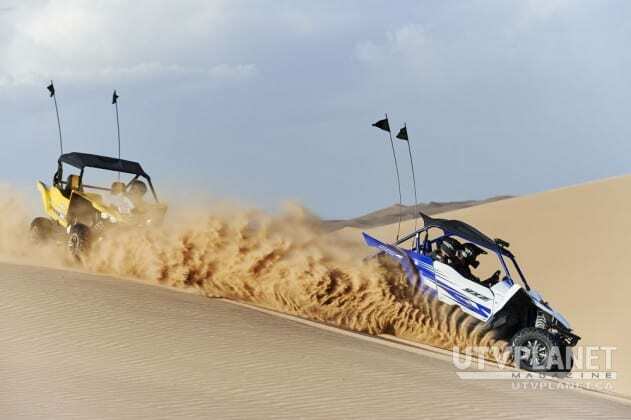 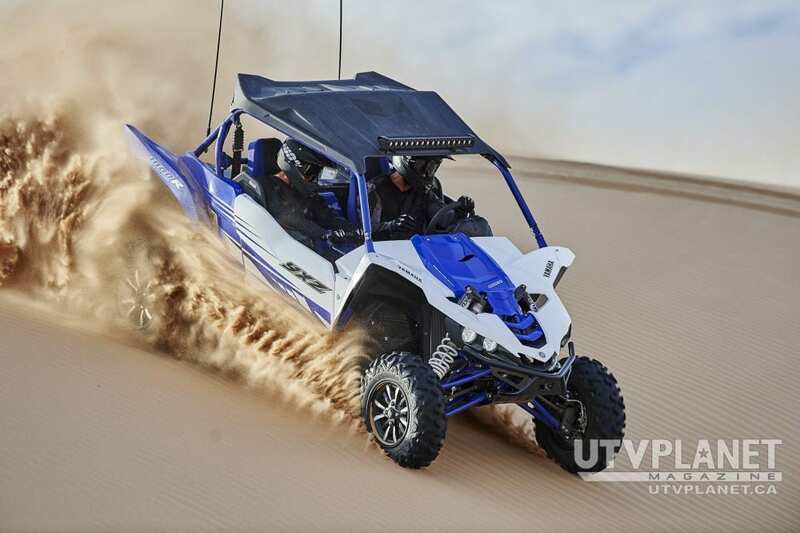 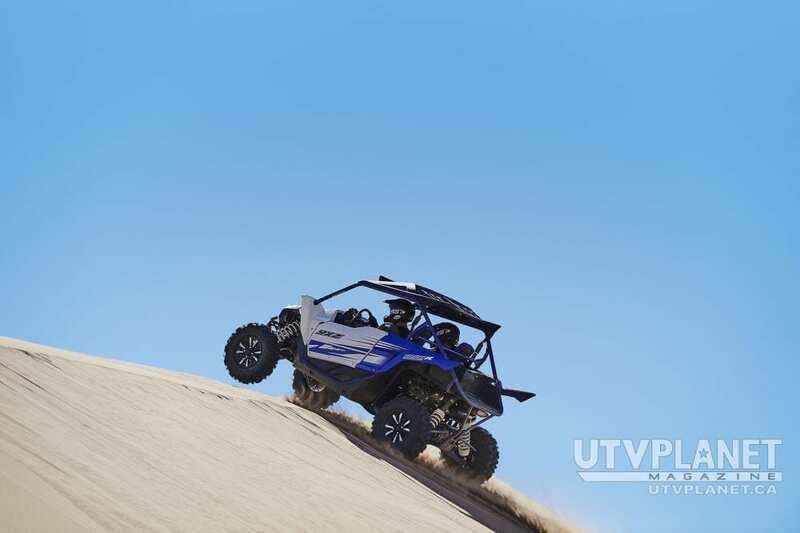 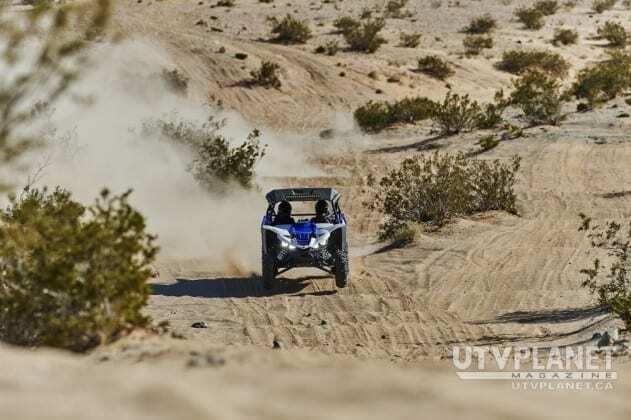 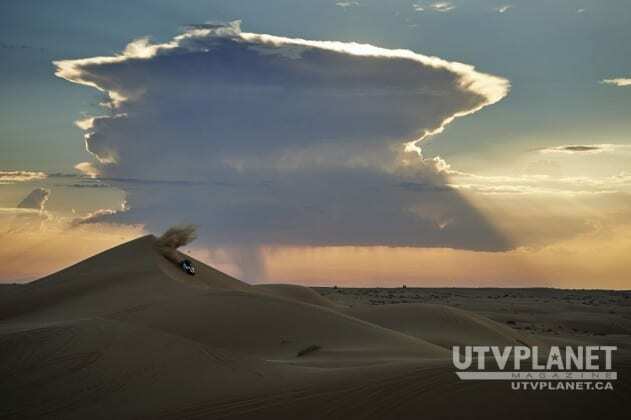 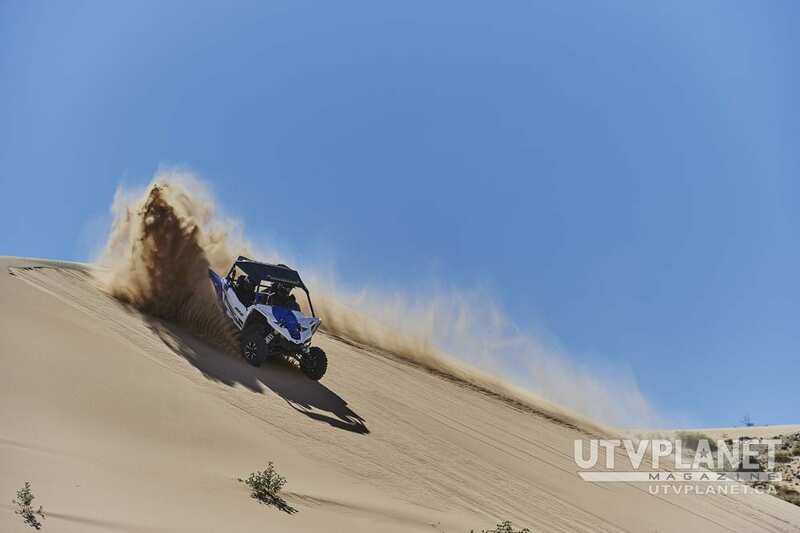 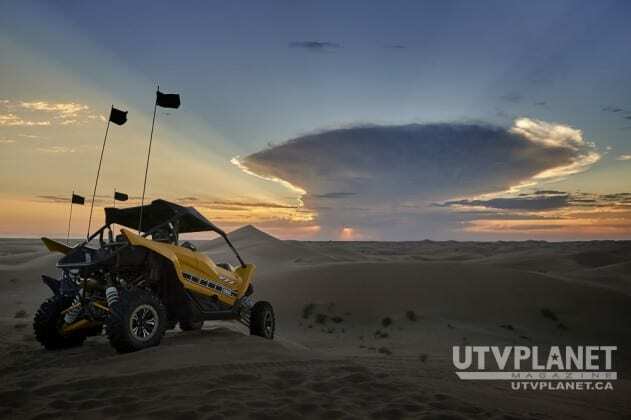 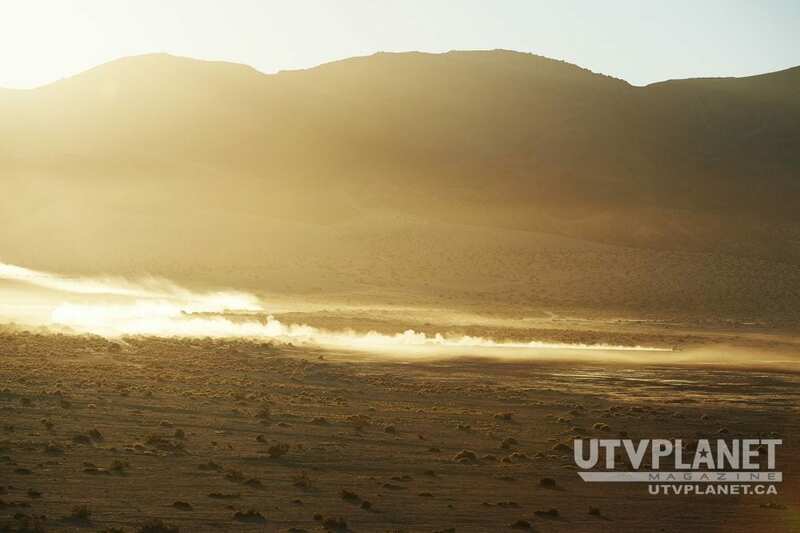 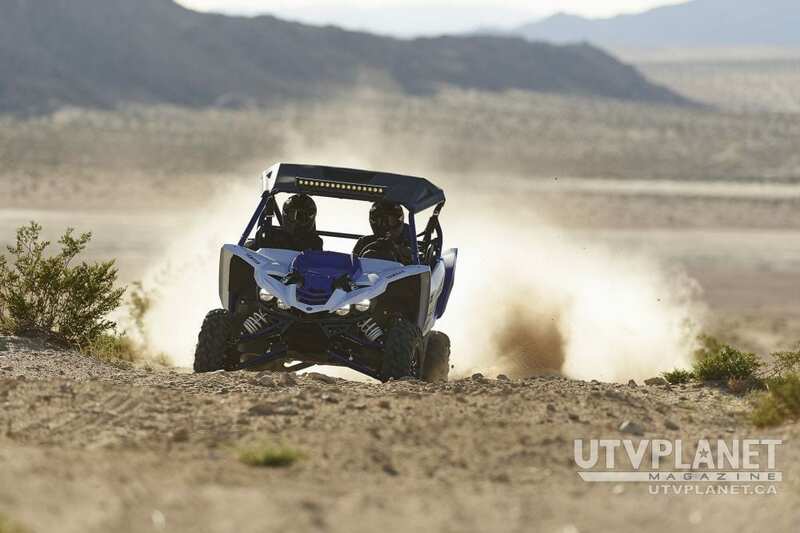 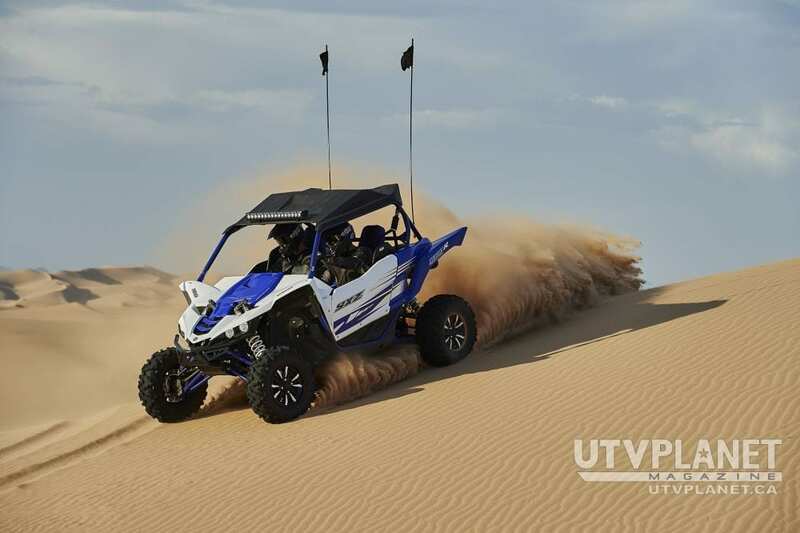 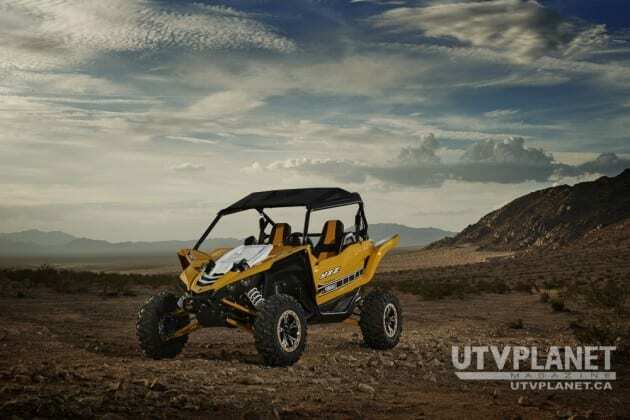 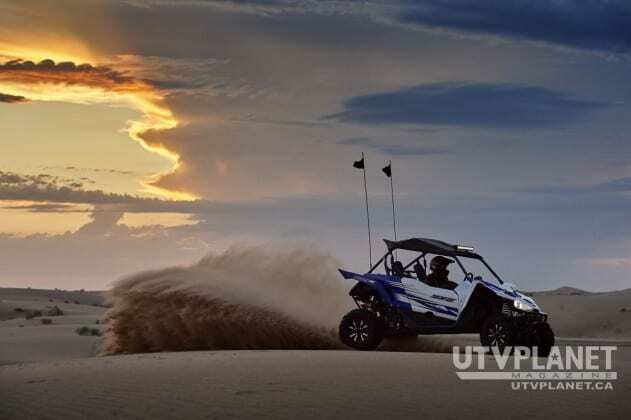 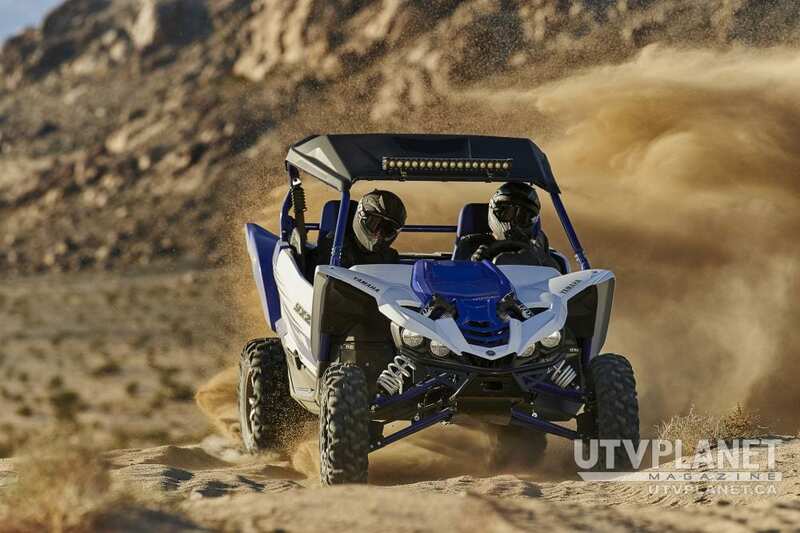 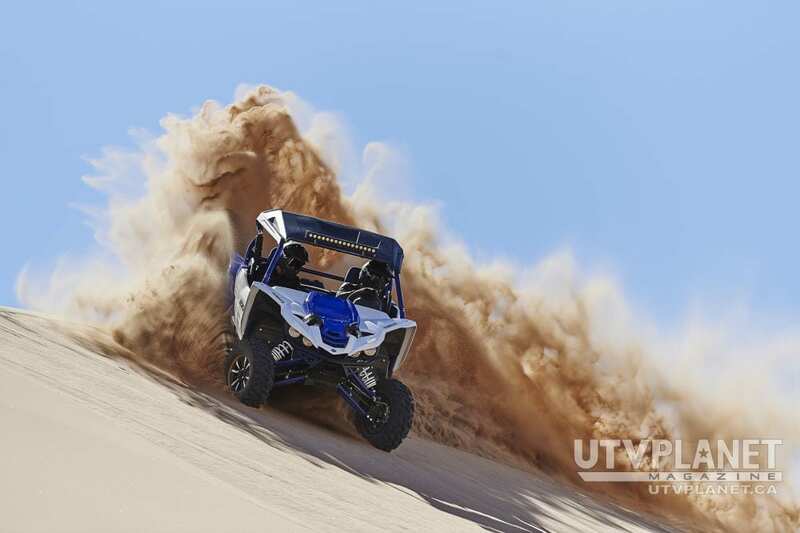 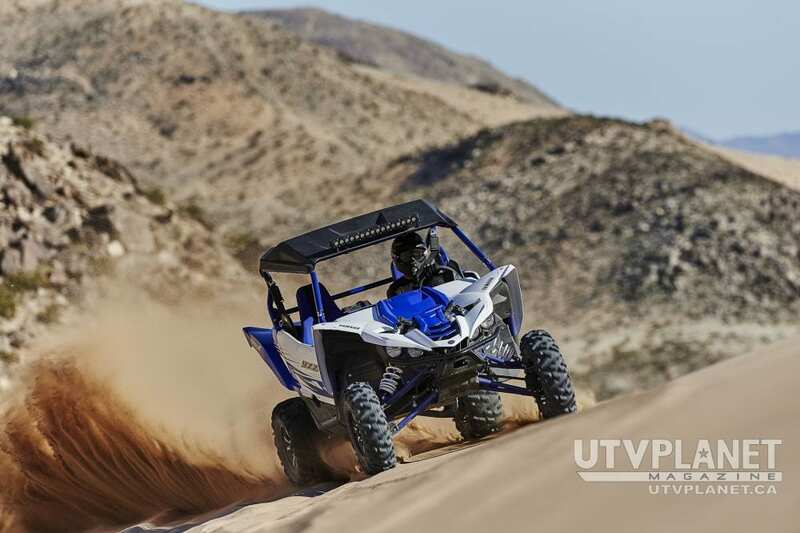 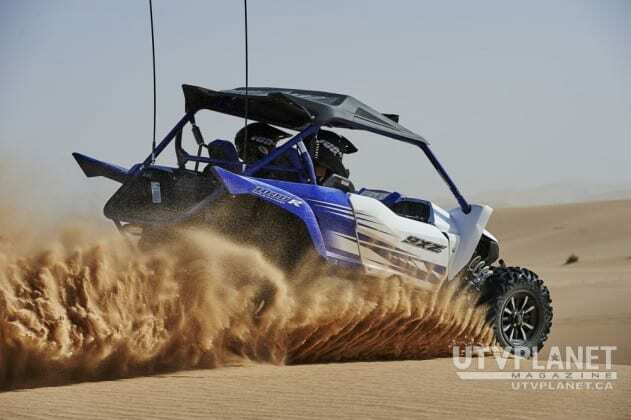 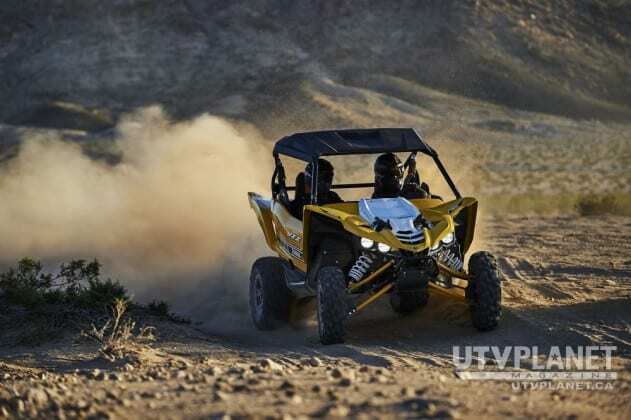 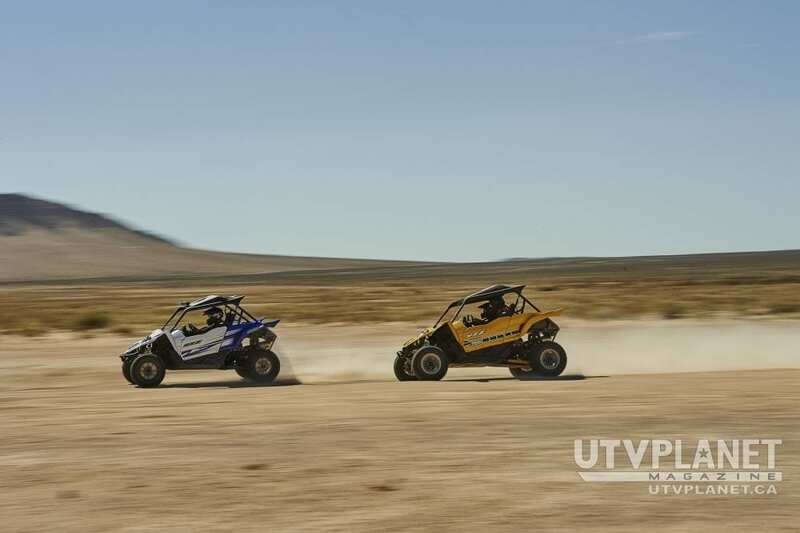 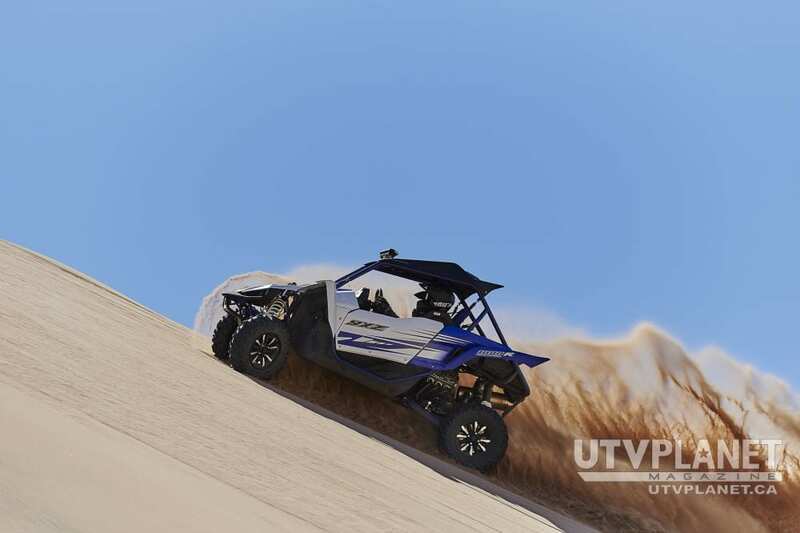 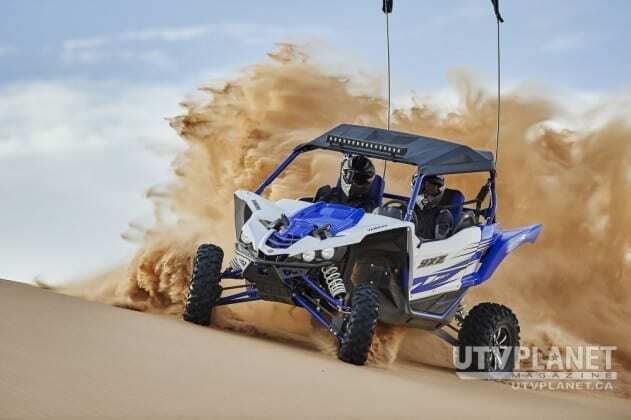 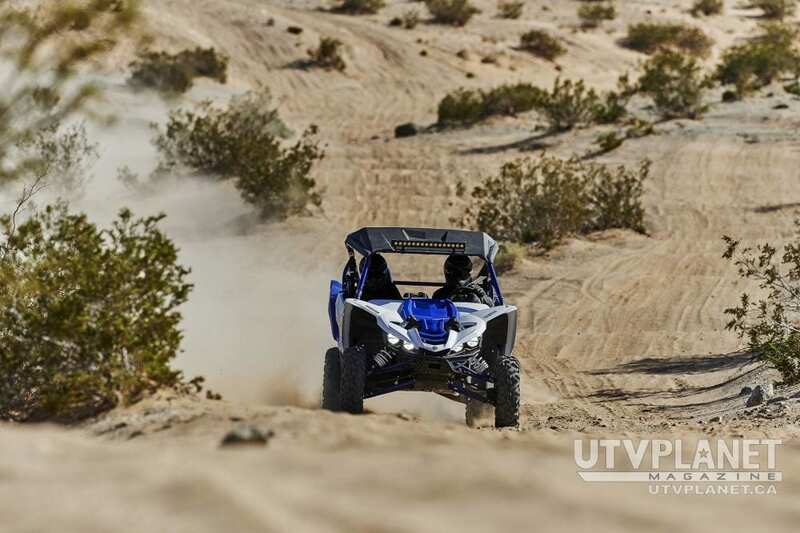 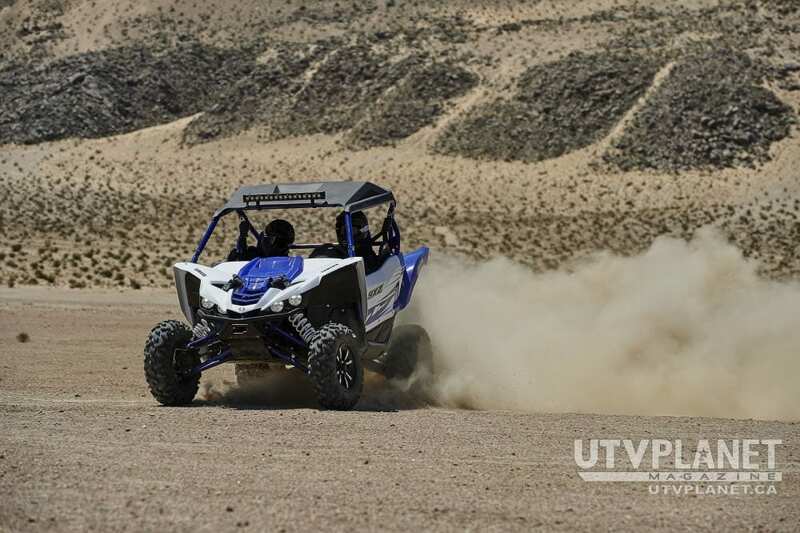 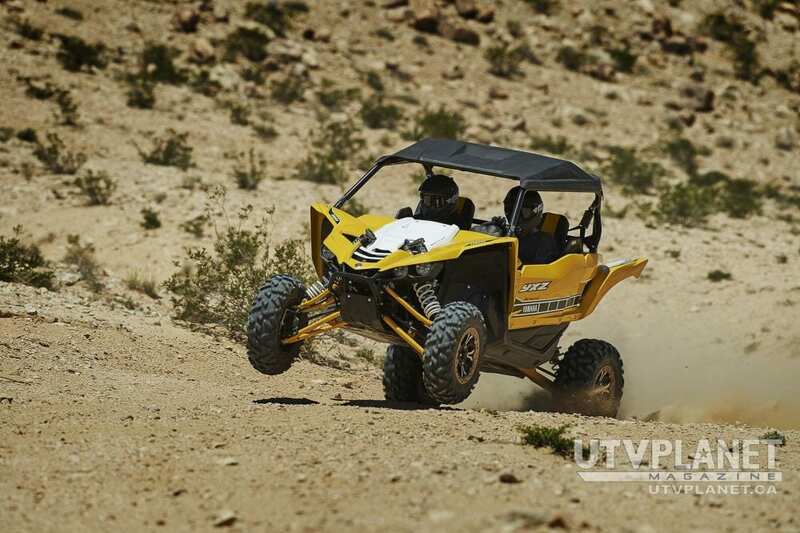 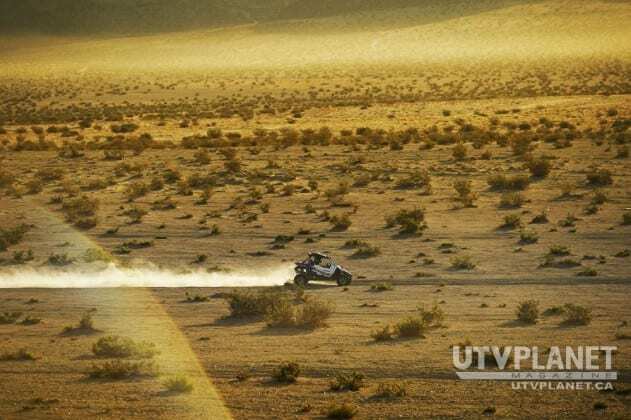 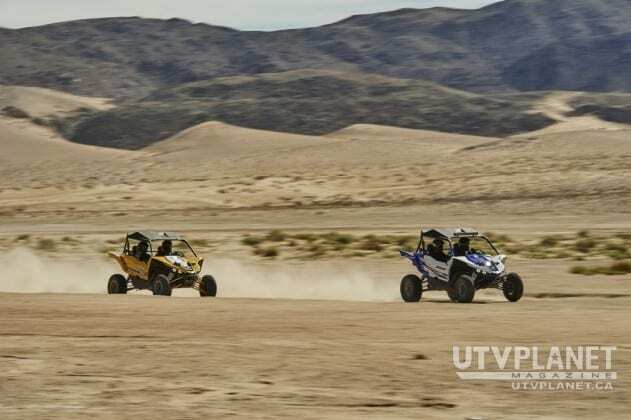 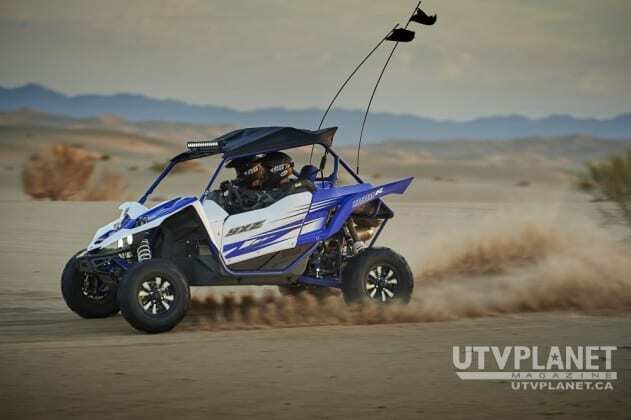 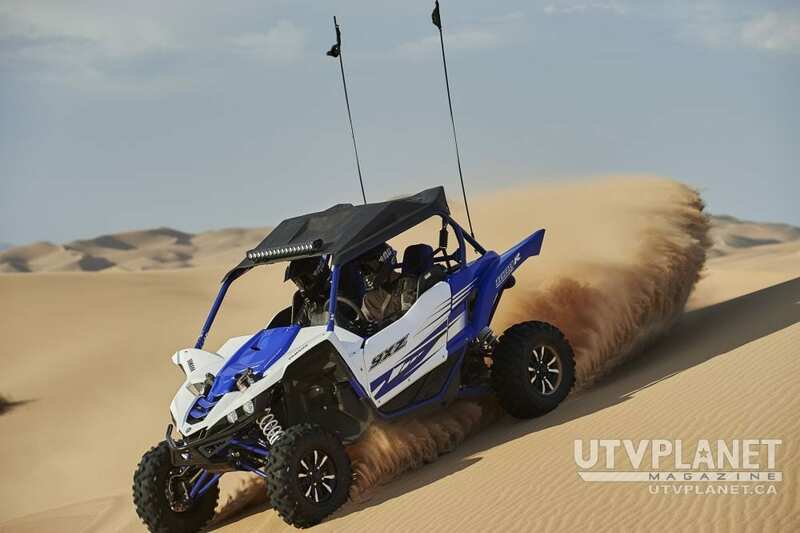 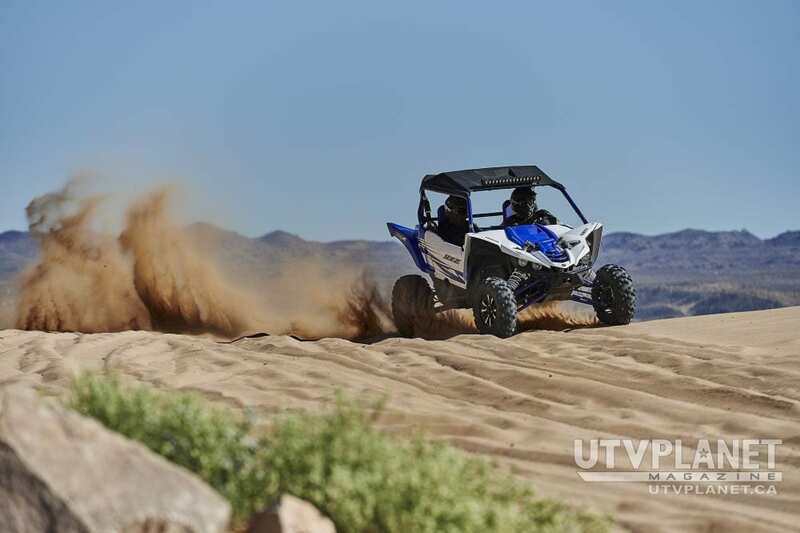 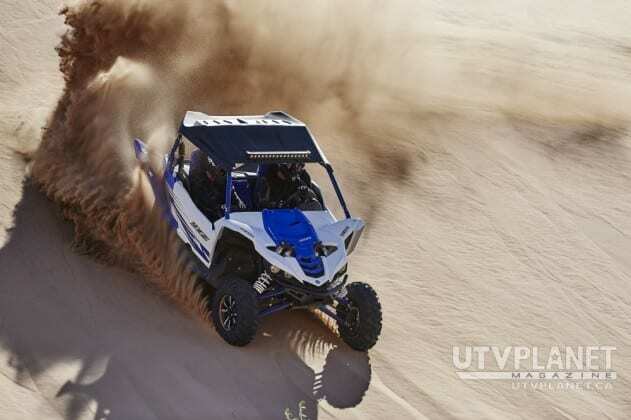 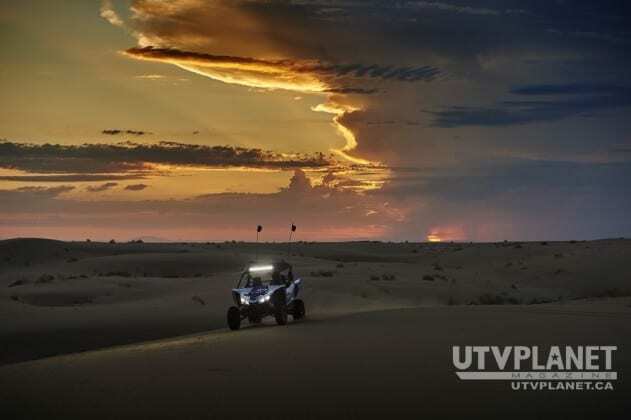 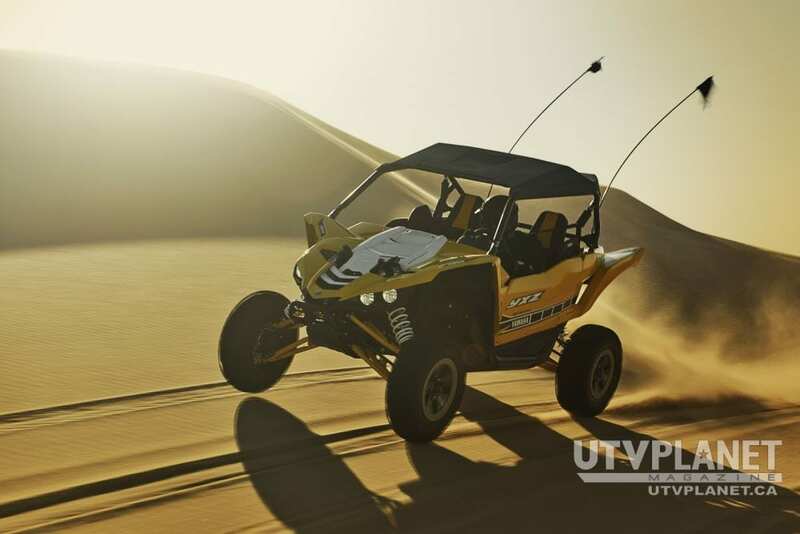 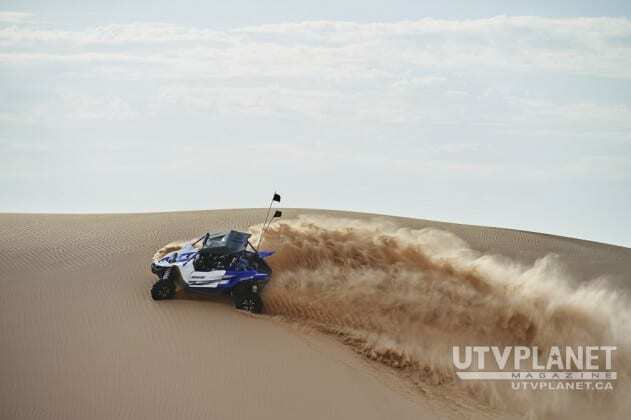 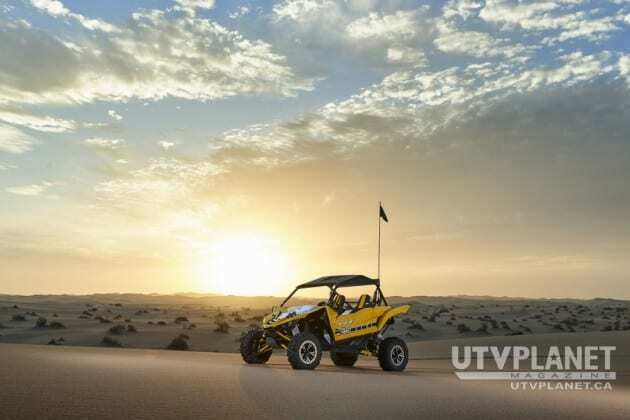 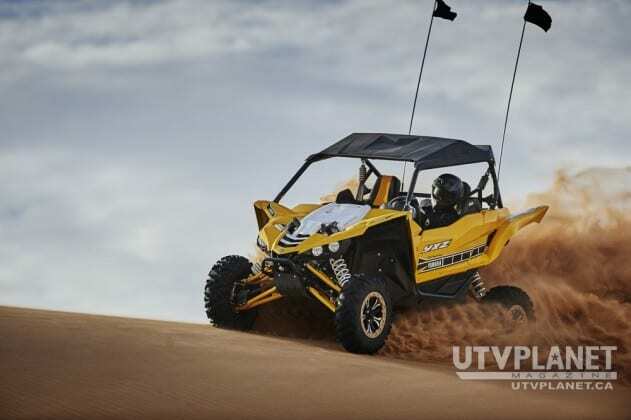 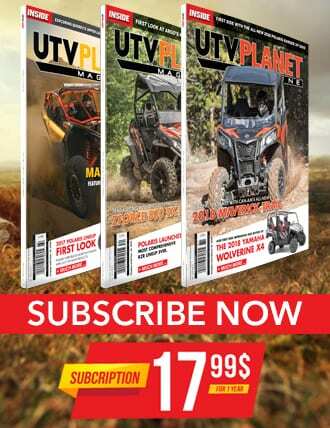 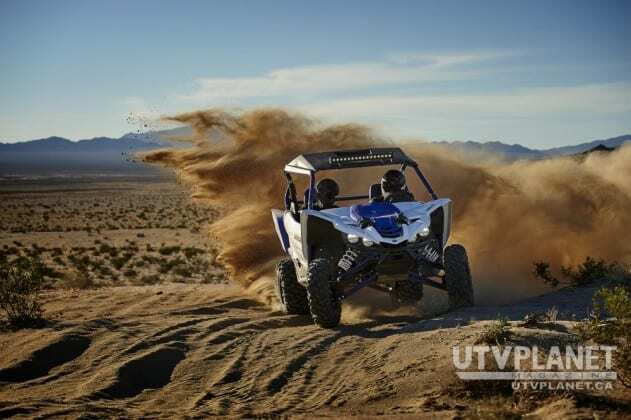 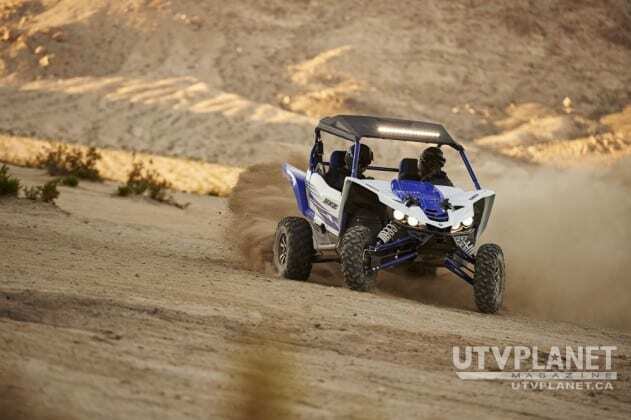 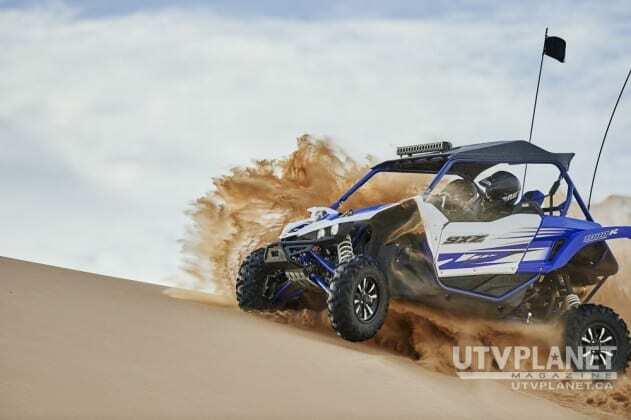 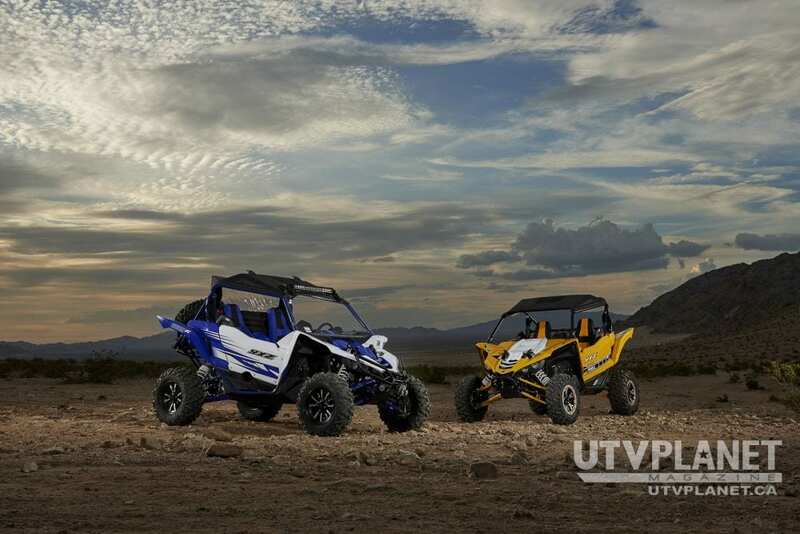 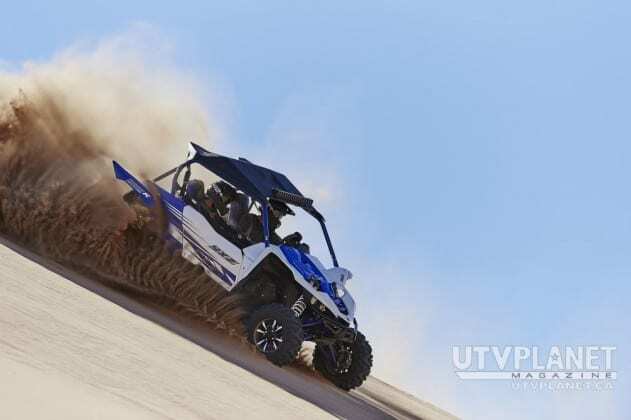 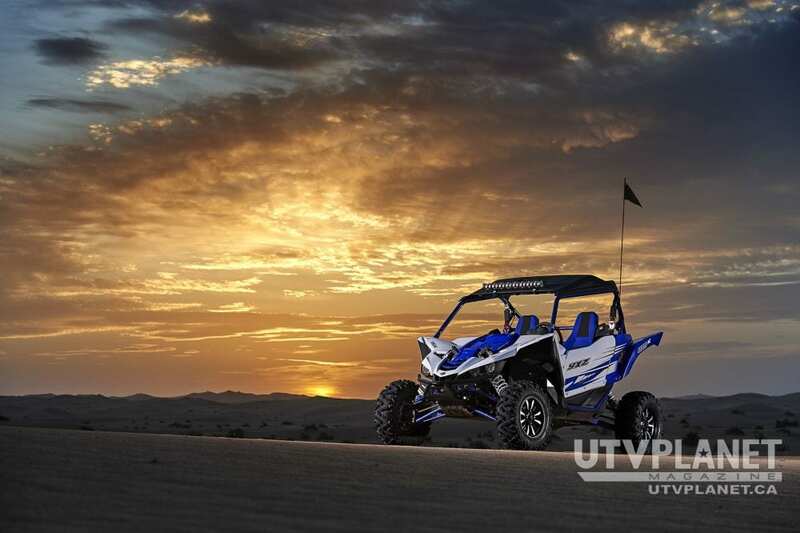 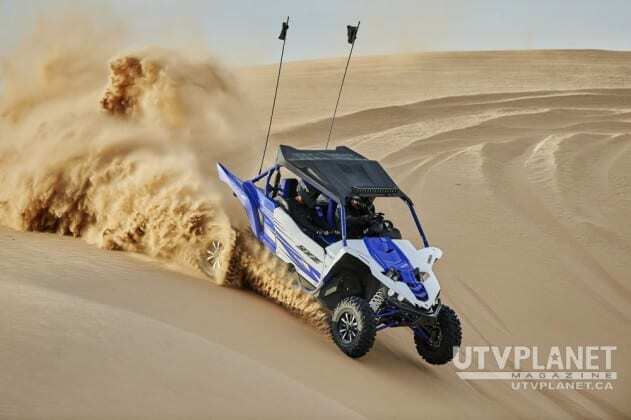 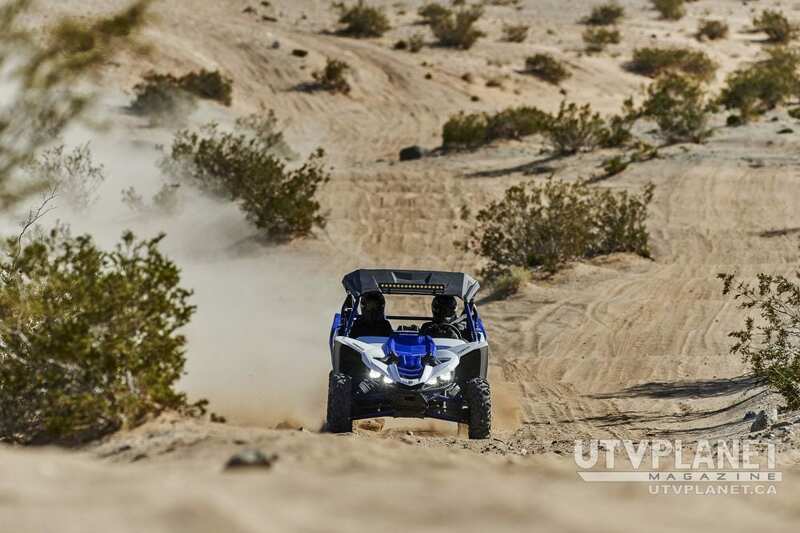 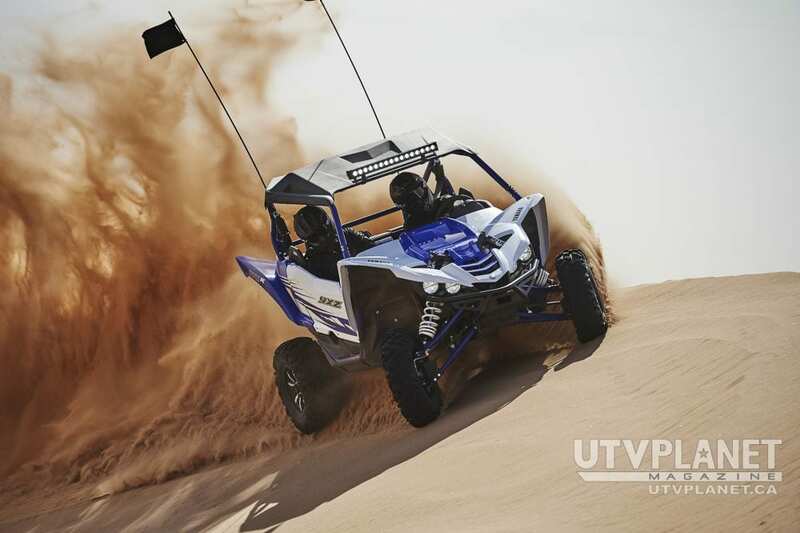 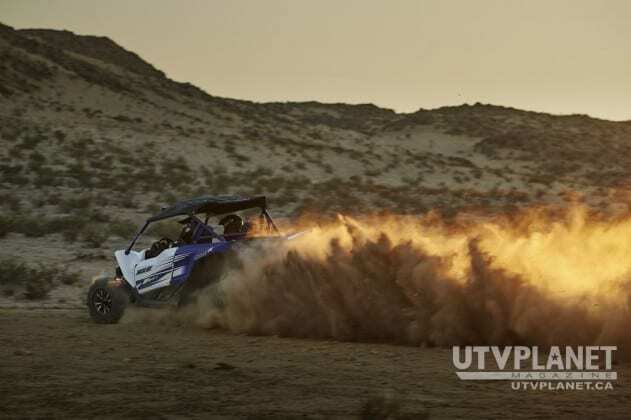 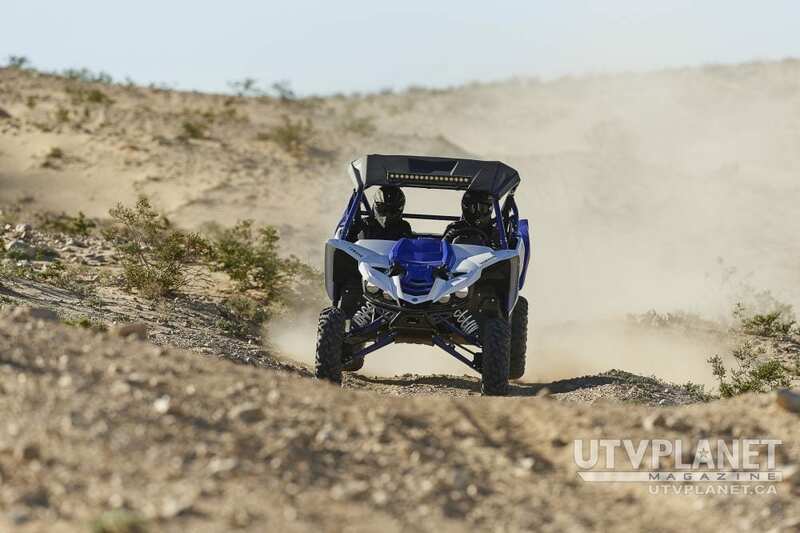 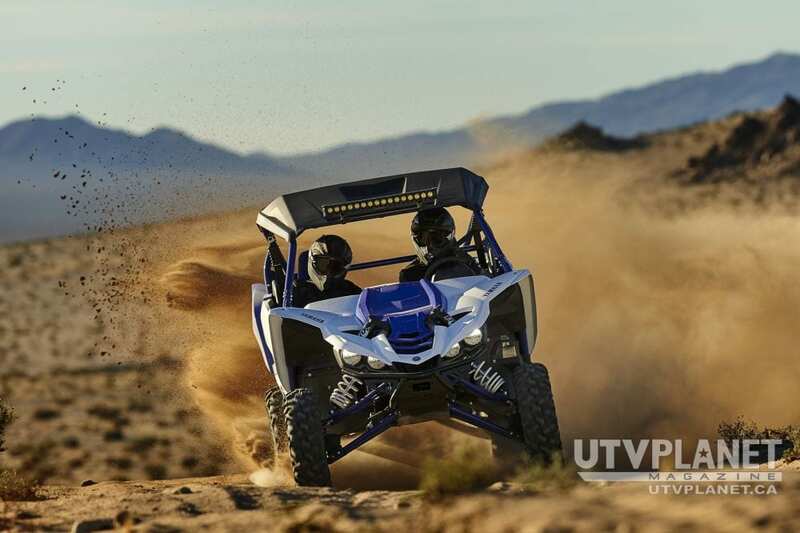 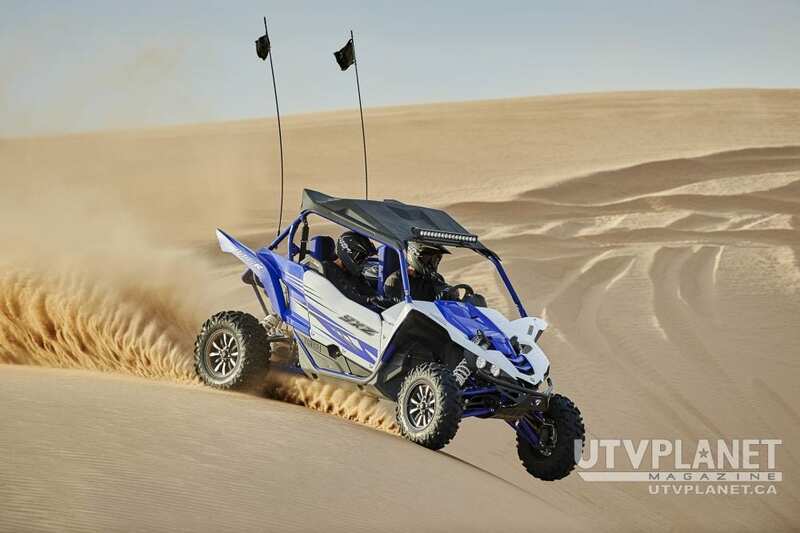 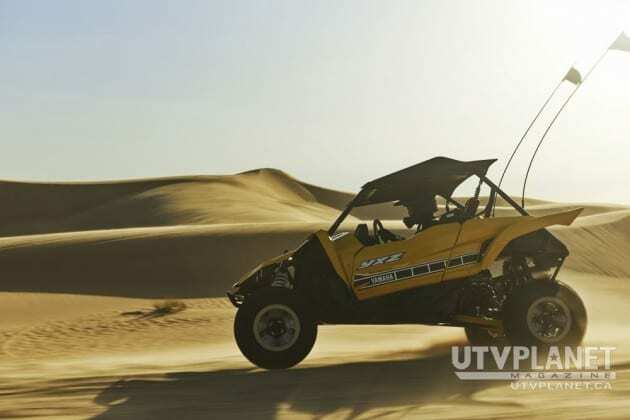 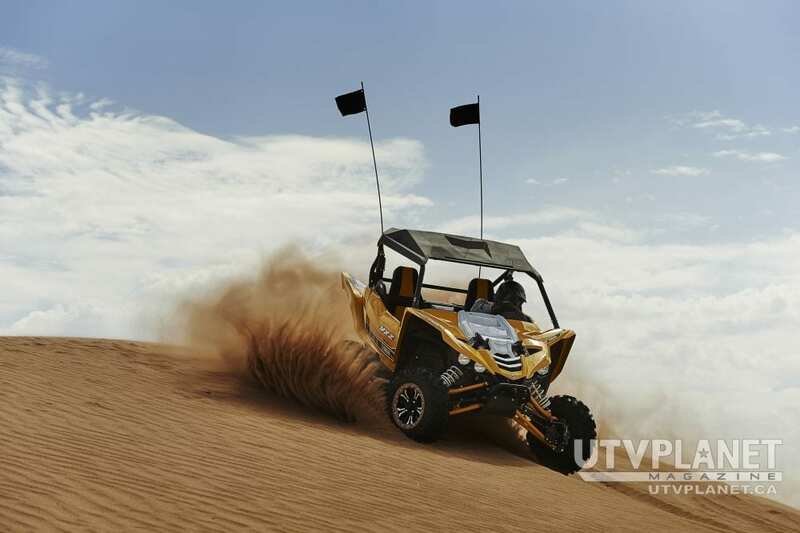 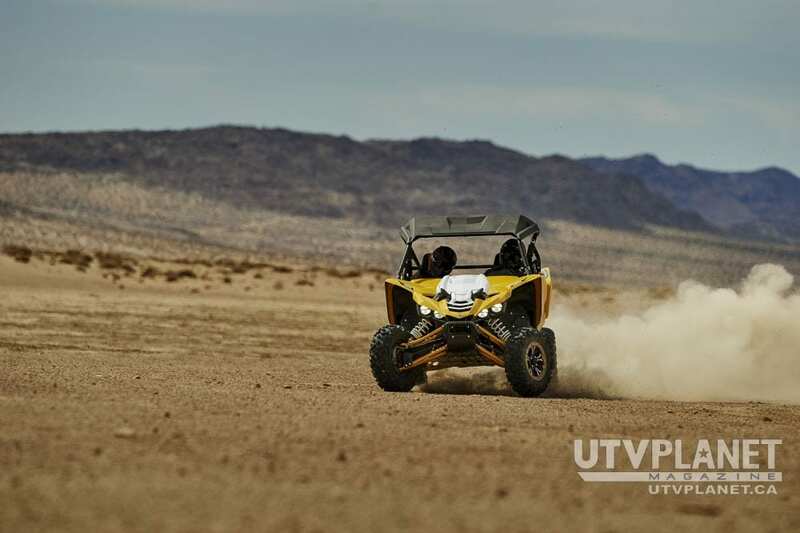 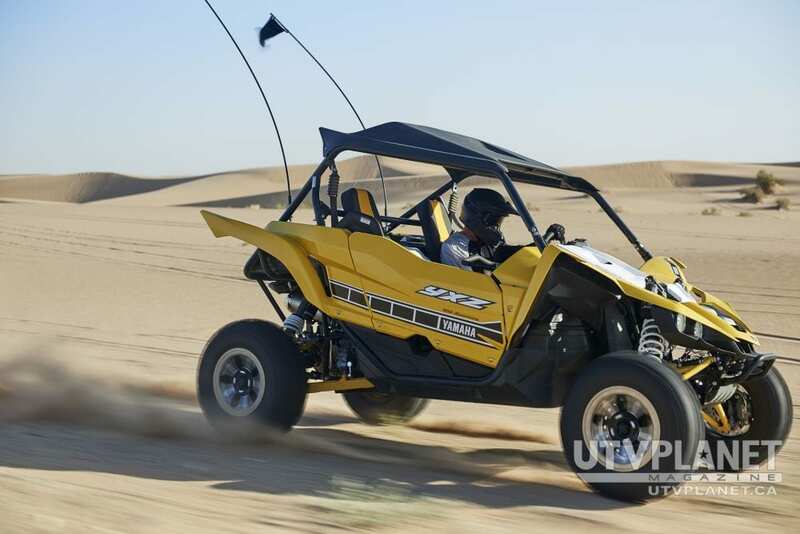 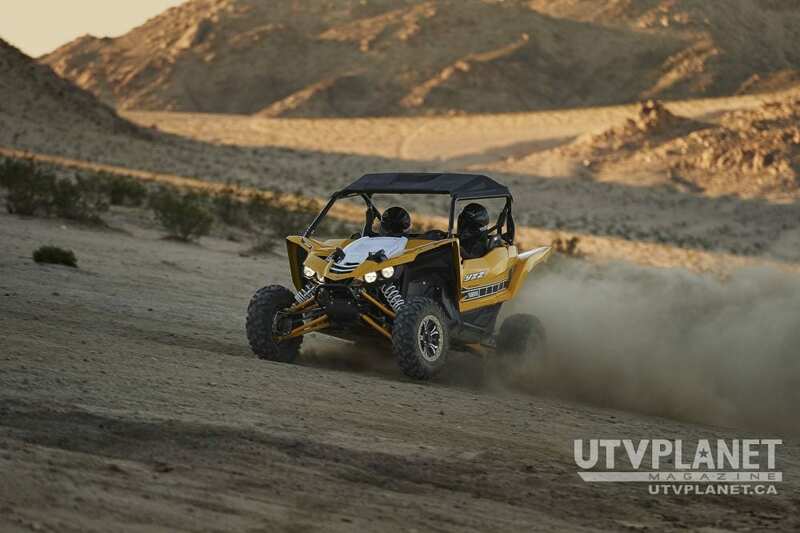 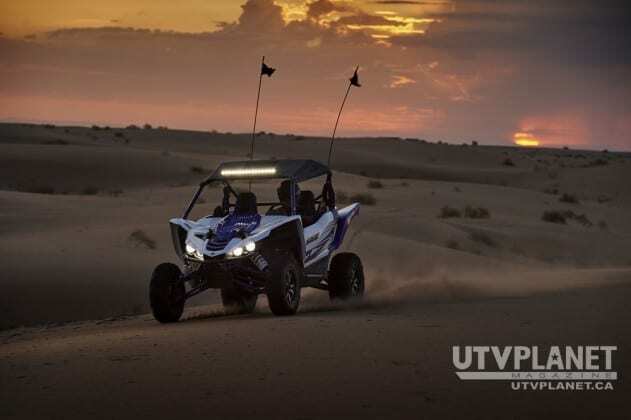 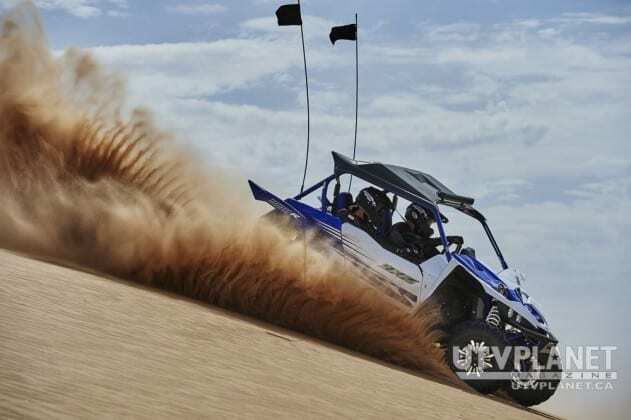 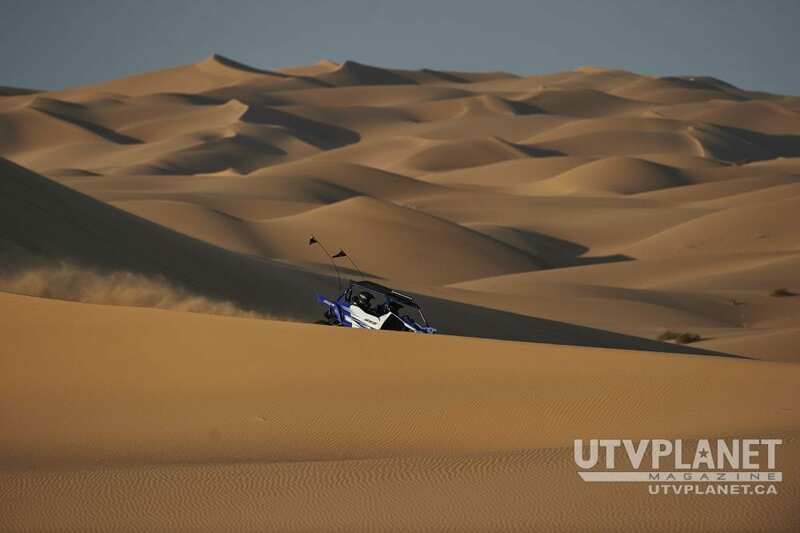 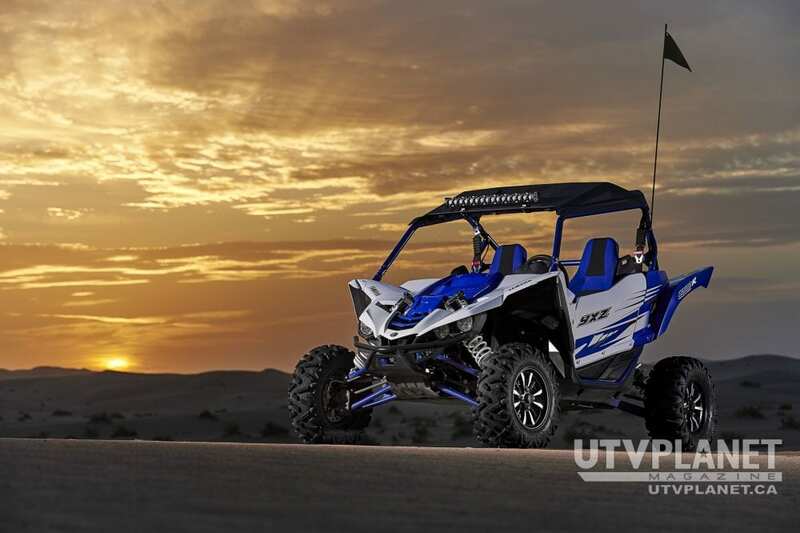 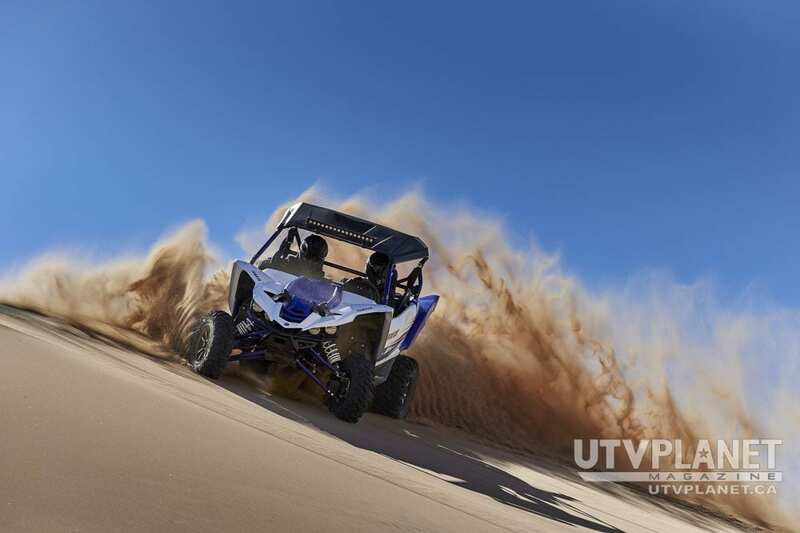 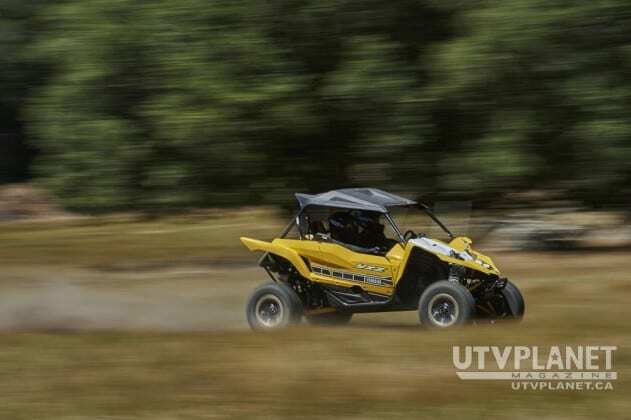 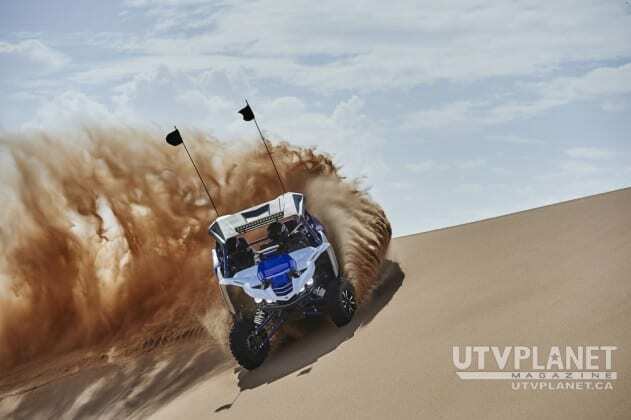 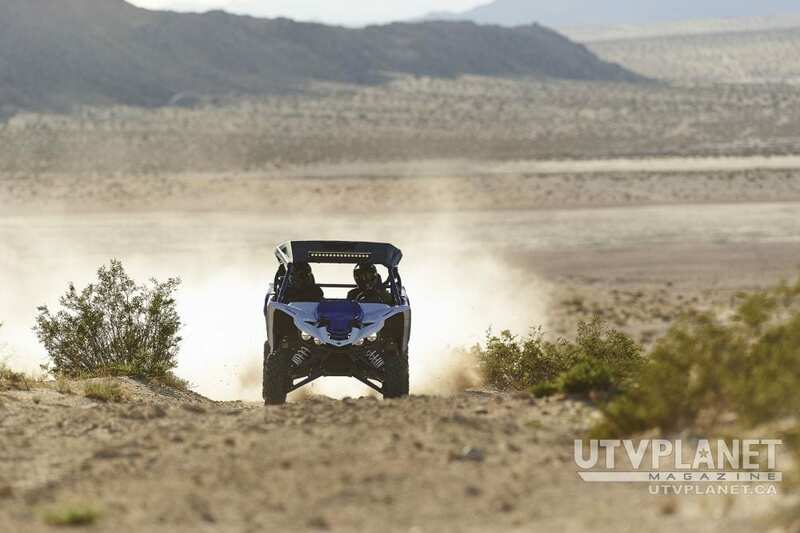 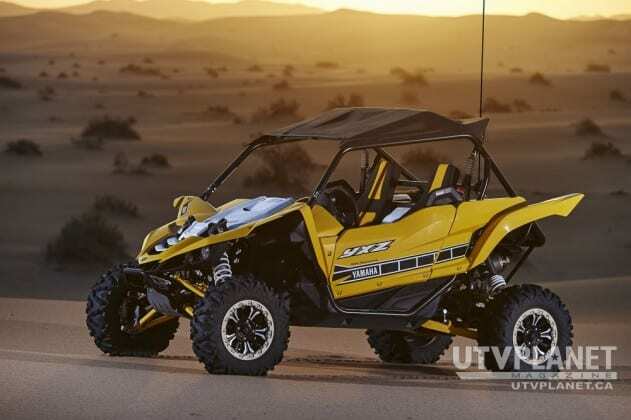 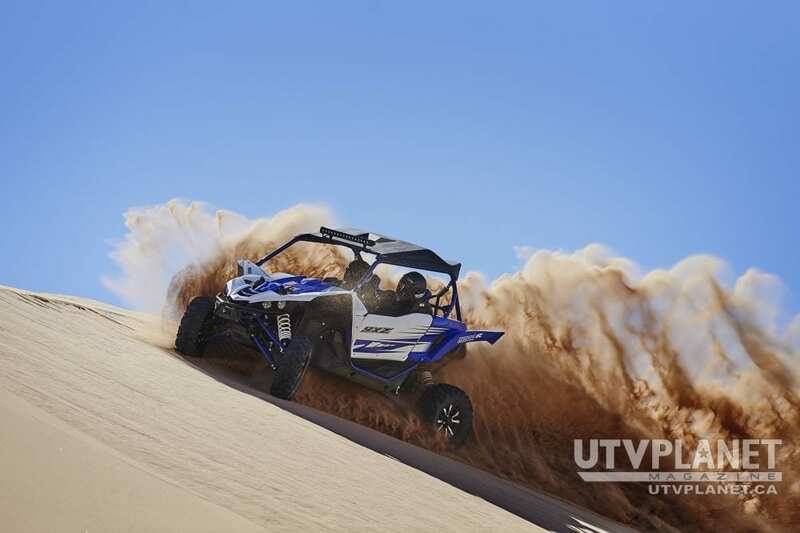 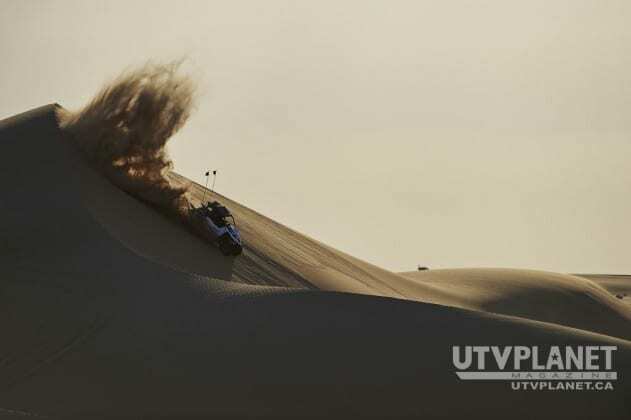 Boasting a high-performance 3-cylinder 998cc engine with a class-defining 5-speed sequential shift manual transmission, the two-seat YXZ1000R provides a superior driver-connected experience in the dunes, desert or on the trail. 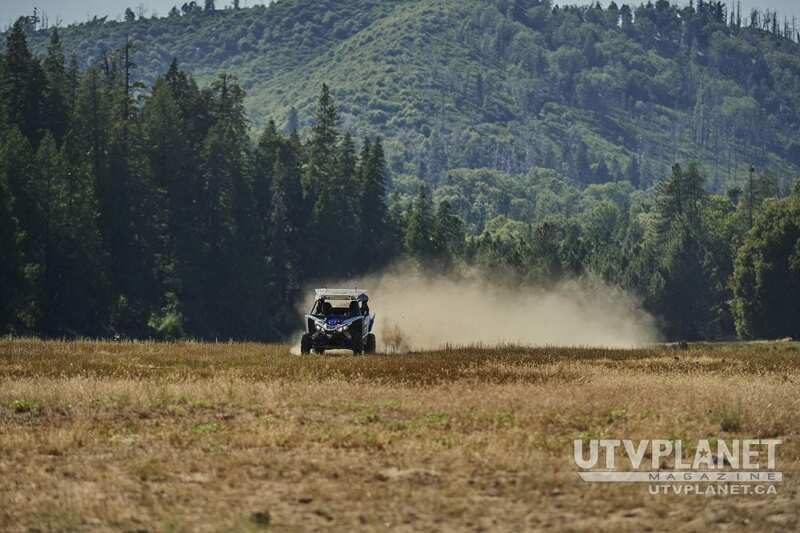 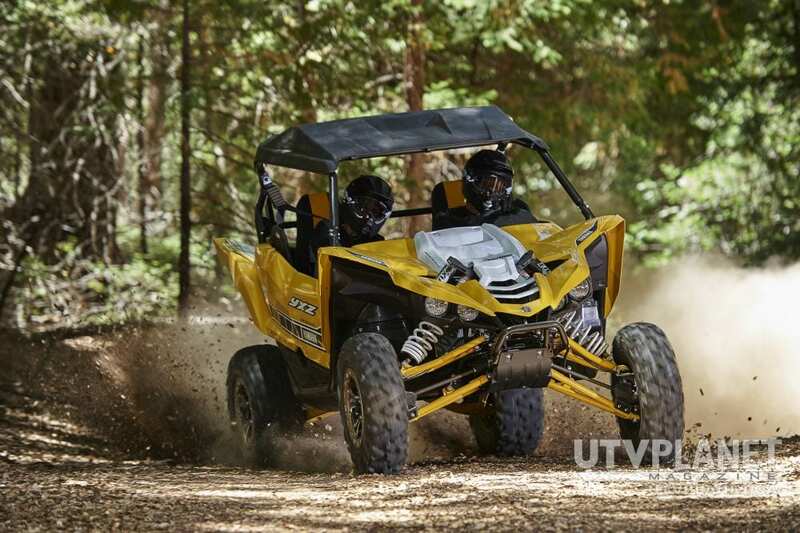 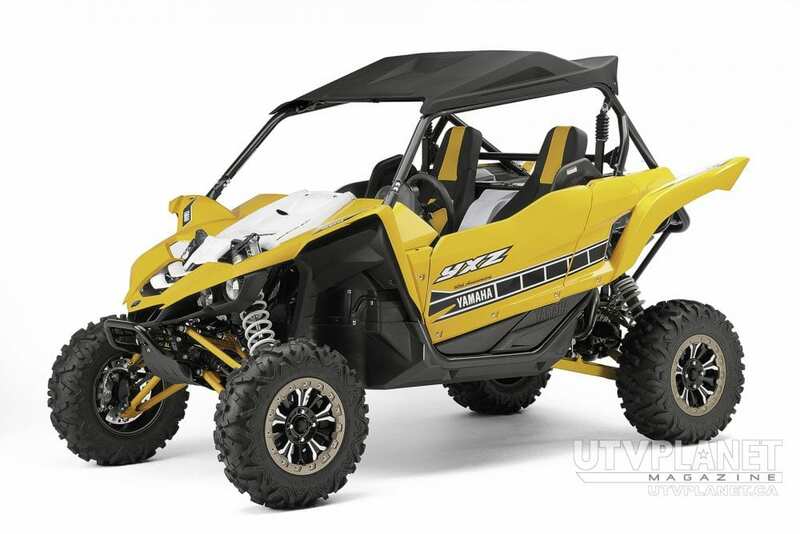 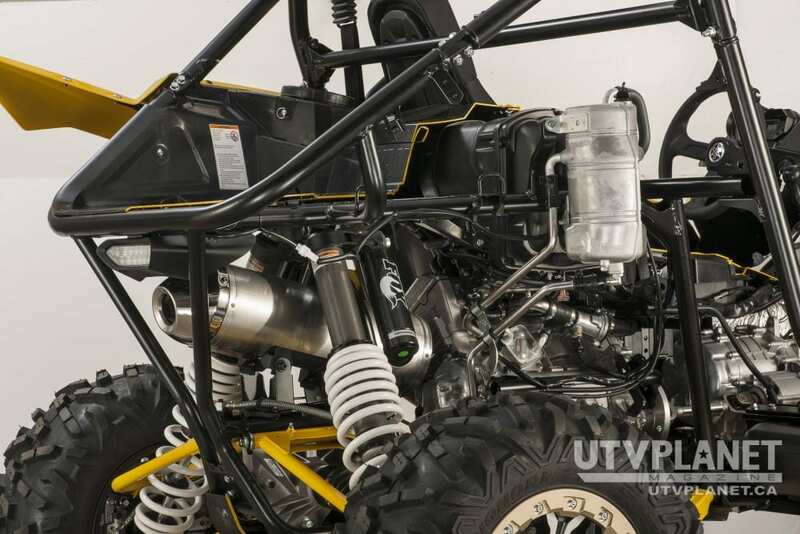 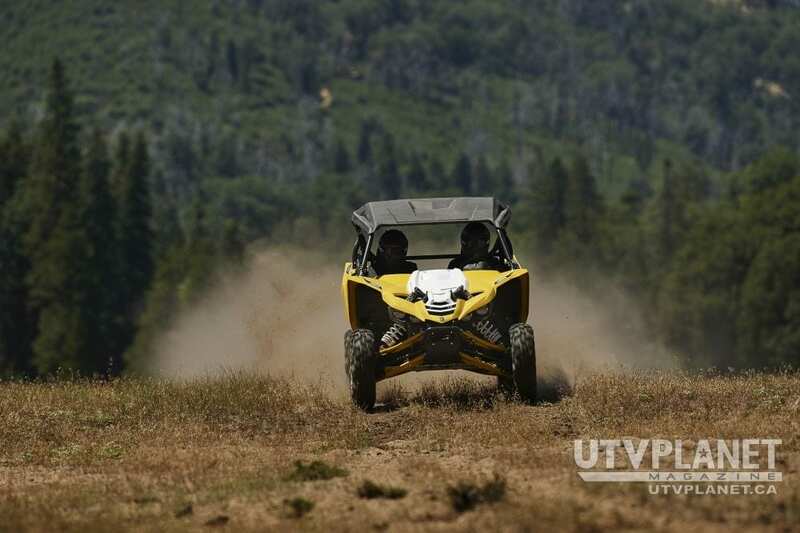 The YXZ1000R’s 3-cylinder, 12-valve, DOHC, liquid cooled, 998cc engine puts out the most reliable and durable power of any 1,000cc-class machine. 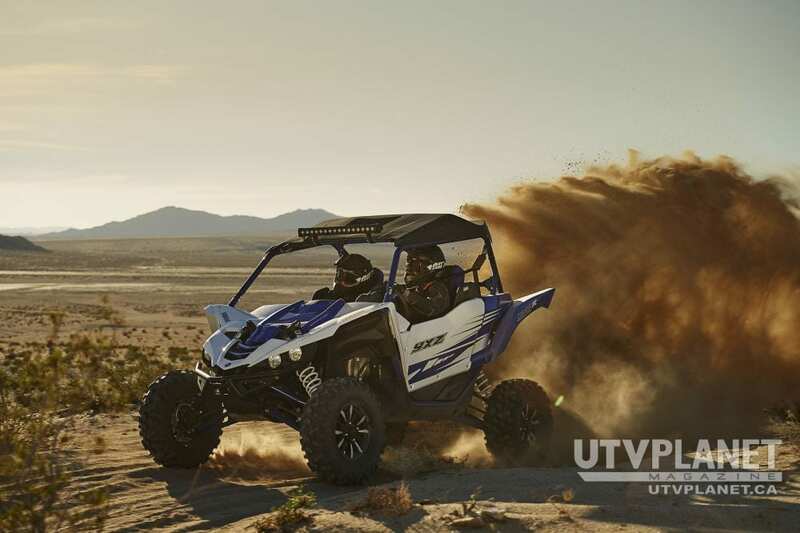 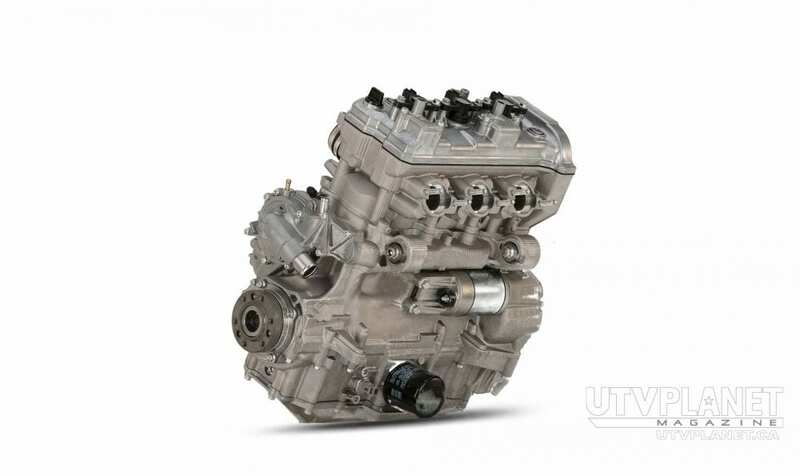 As the industry’s first sport 3-cylinder engine, it boasts an aggressive 11.3:1 compression ratio and 10,500 RPM redline to provide a true sport SxS experience. 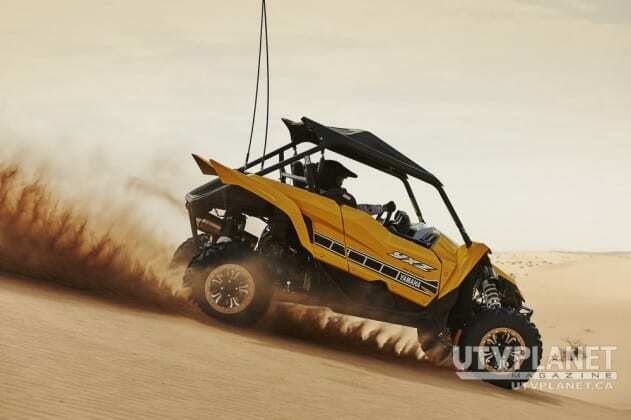 With broad, linear torque, the YXZ1000R responds to driver input with exciting sport performance power from low- to high-rpm range, and the triple throttle bodies provide a more direct connection between driver throttle input and engine response. 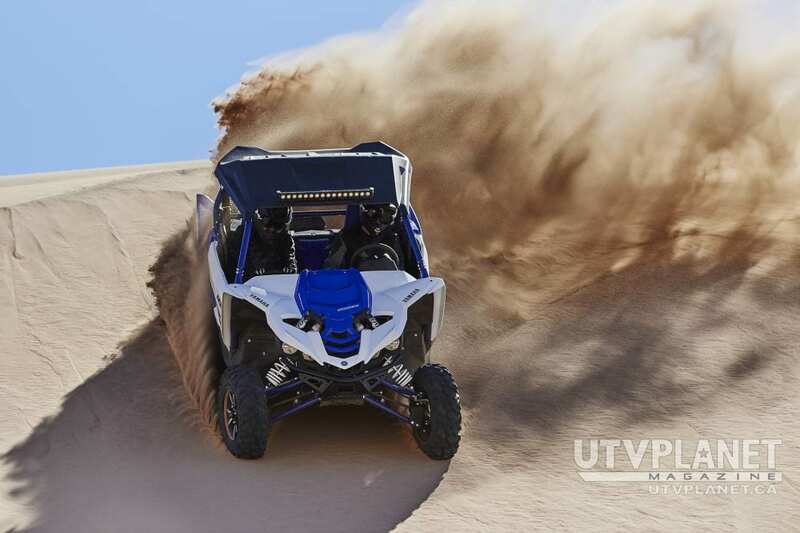 A high-mounted, high-volume clean air inlet provides maximum airflow, while dual air filters – one oiled foam and wet pleated paper type – provide maximum filtration and superior engine performance in even the harshest riding environments. 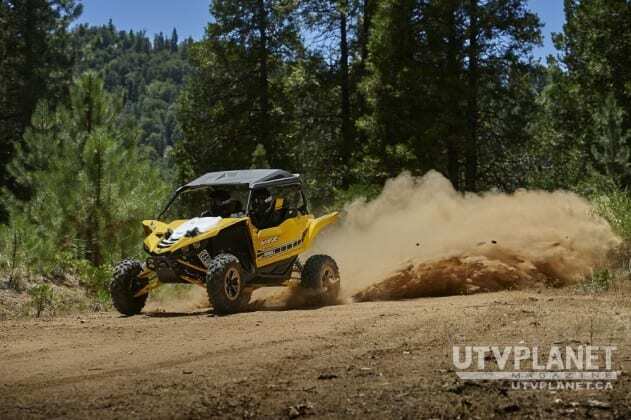 The durable and reusable foam filter features tool-free access for simplified maintenance. 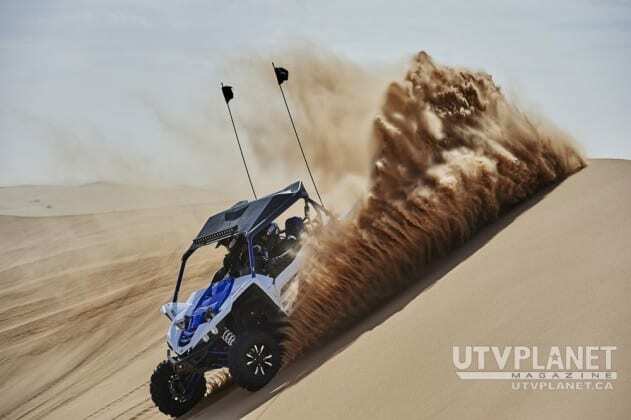 The YXZ1000R incorporates an all-new high volume stainless steel exhaust system, complementing the vehicle’s aggressive styling. 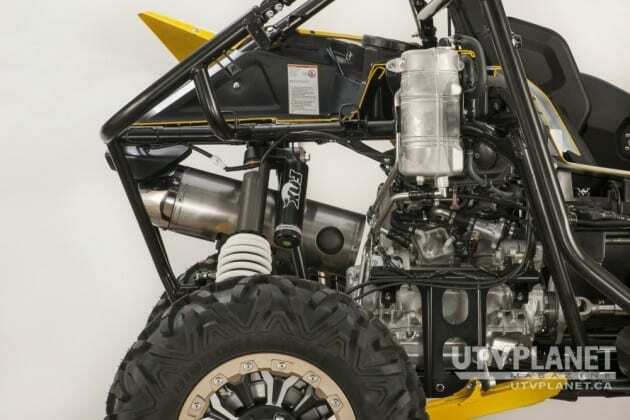 The three-into-one YXZ1000R exhaust is tuned for maximum power output and meets EPA/CARB regulations with a muffler mounted integrated honeycomb catalyzer and removable spark arrestor. 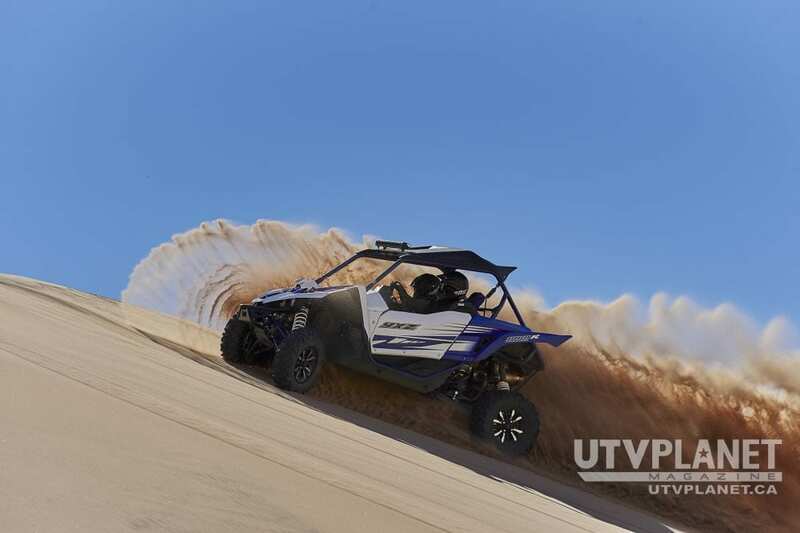 The YXZ1000R features the industry’s first fully manual 5-speed sequential shift transmission in a SxS vehicle, delivering a direct connection between driver and machine for superior performance, confidence and the first and only true pure sport SxS experience. The 5-speed sequential shift is manually operated via a clutch pedal and short-stroke shift lever for smooth, secure gear engagement. 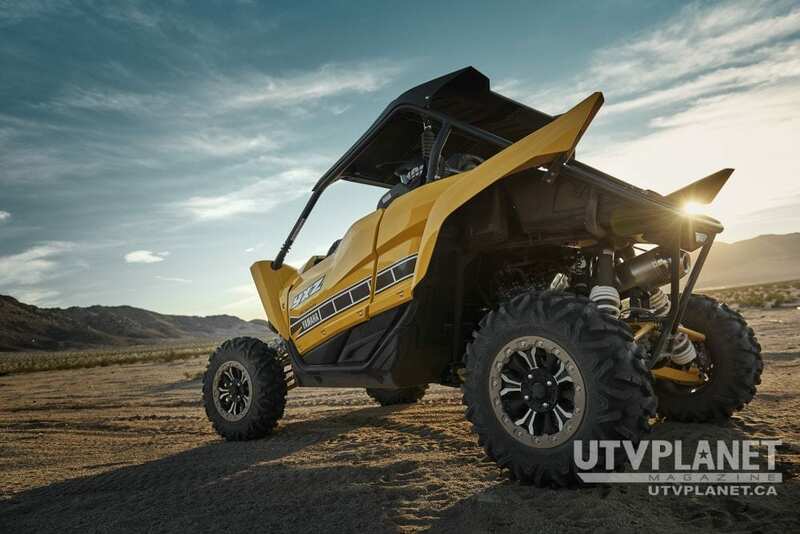 With the YXZ1000R’s direct-drive transmission, driveline efficiency is increased, supplying optimal engine power directly to the rear wheels, while cam dampers on both the input and output shafts keep shifting smooth and precise. 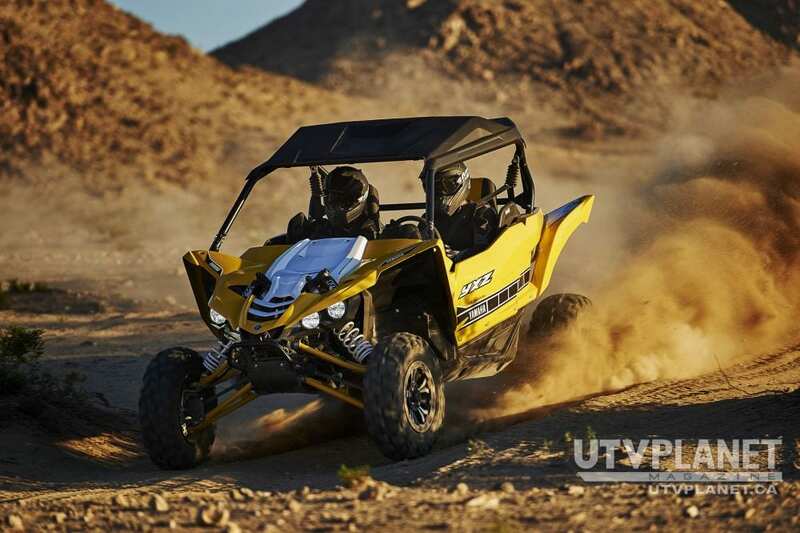 The YXZ1000R’s all-new clutch design is optimized for the vehicle’s class-leading engine output, providing a smooth and connected shifting feeling with reliable power. The all-new sport-inspired foot-pedal operated hydraulic clutch system provides light, consistent and natural feeling feedback to the driver, increasing confidence in challenging off-road terrain. 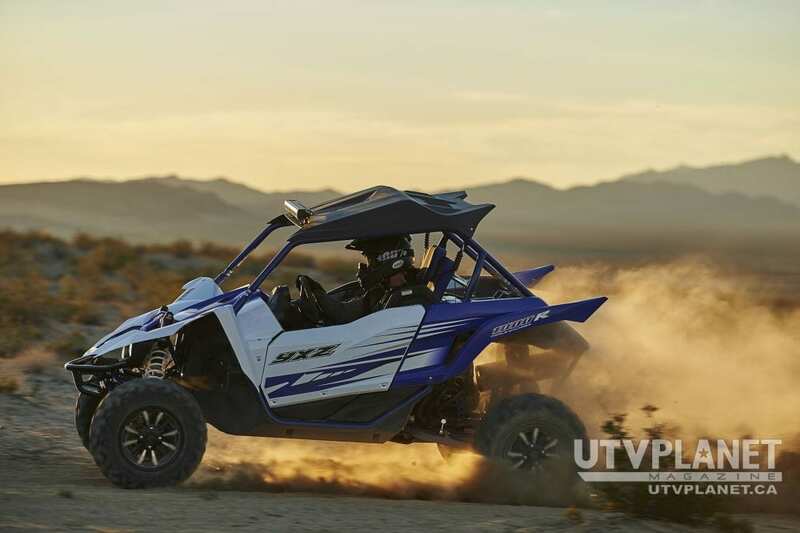 The YXZ1000R is born of true Yamaha performance DNA serving up unmatched handling characteristics, resulting in the vehicle’s features being perfectly positioned and integrated into a single, seamless package working as one. 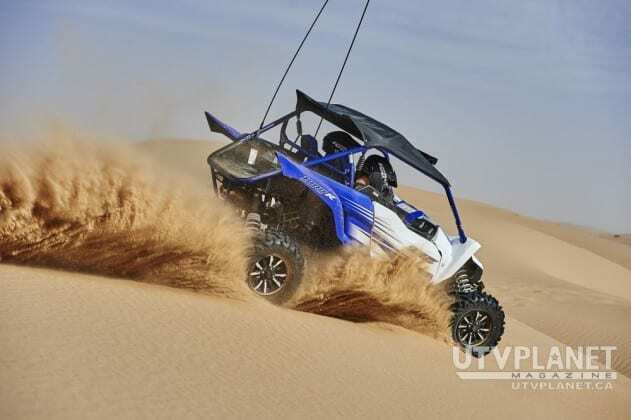 Strategically mounted low and longitudinally in the chassis, the engine placement affords the YXZ1000R long rear wheel and suspension travel for superior sport SxS performance. 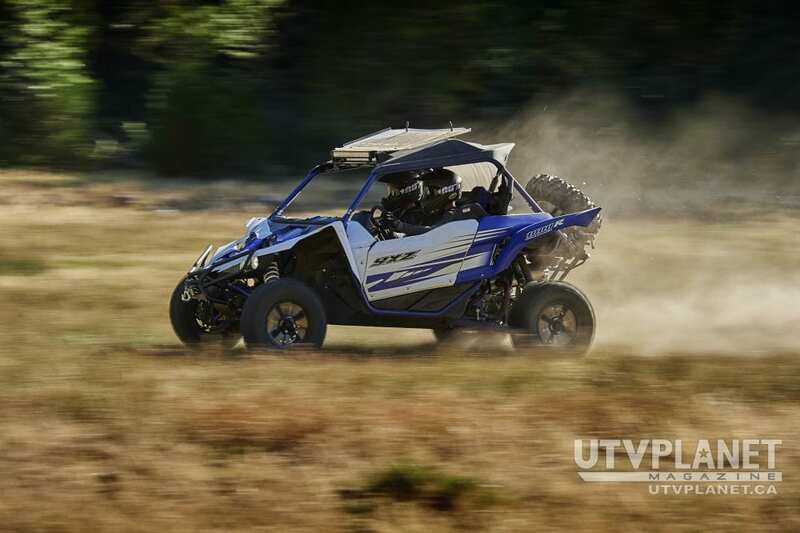 A single shaft, one-axis balancer reduces engine vibration by 25% for a more comfortable ride while also allowing a rigid engine mount to reduce weight and offer a more direct throttle/engine feel for the driver. 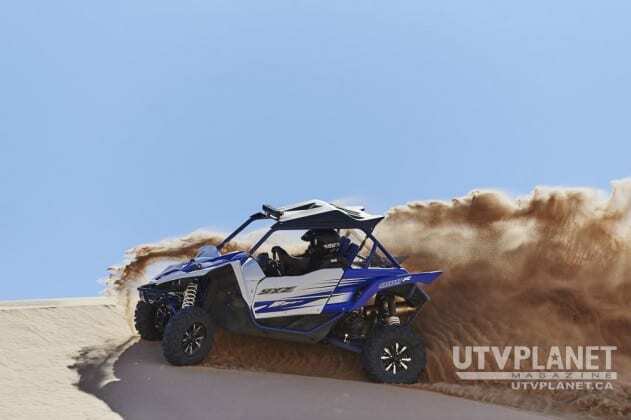 The vehicle’s front differential incorporates Yamaha’s proven On-Command® 2WD, 4WD and 4WD full diff-lock – a driver-controlled system that eliminates the hesitation or slipping experienced in computer-engaged systems. 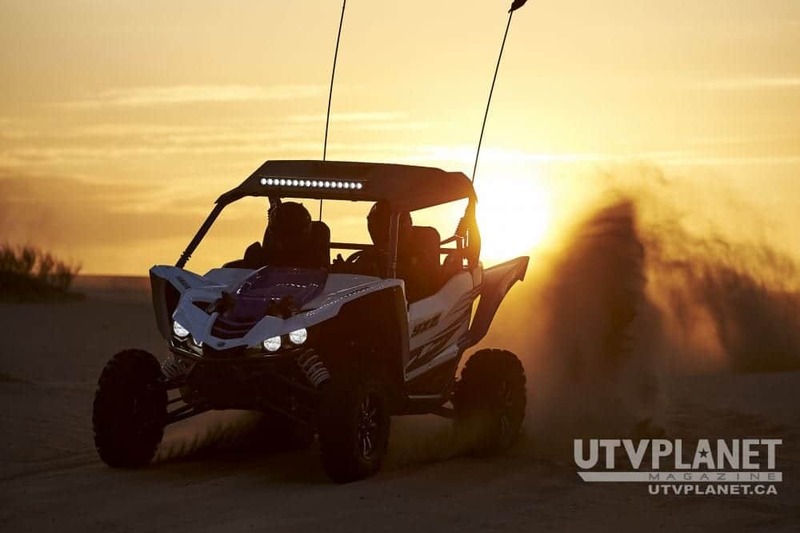 An automotive-style 4WD dial is intuitive and conveniently located on the center console, and provides simple and seamless transitions between the 2WD, 4WD and 4WD full diff lock settings. 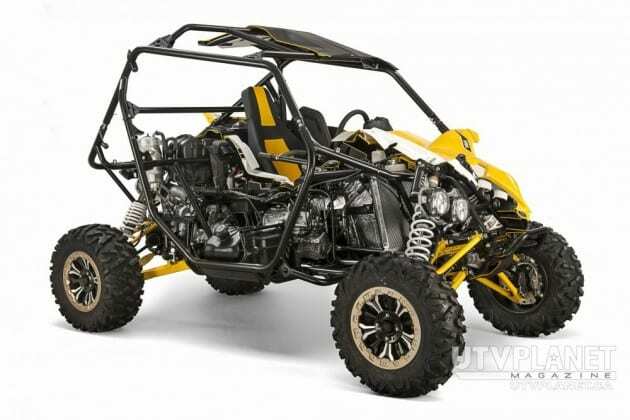 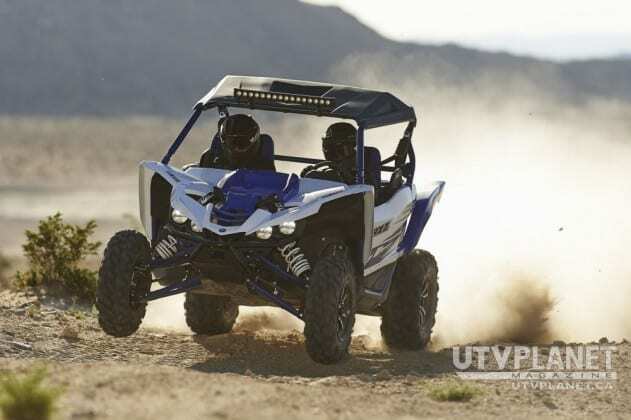 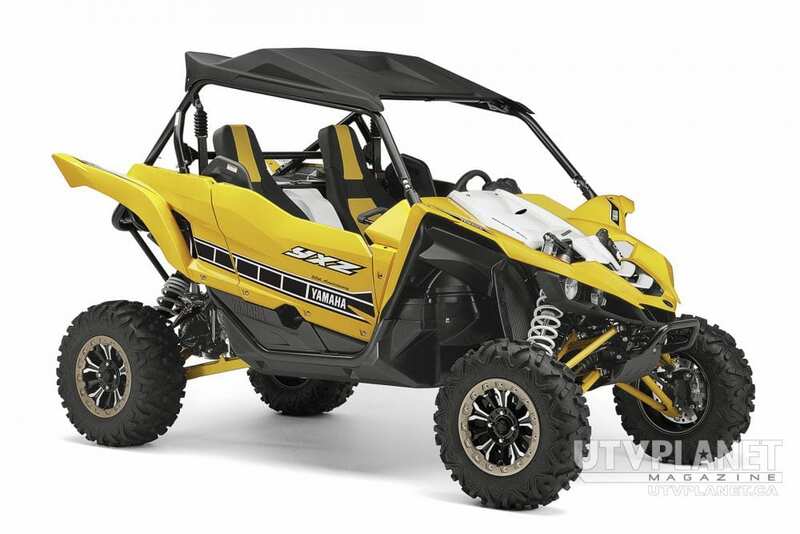 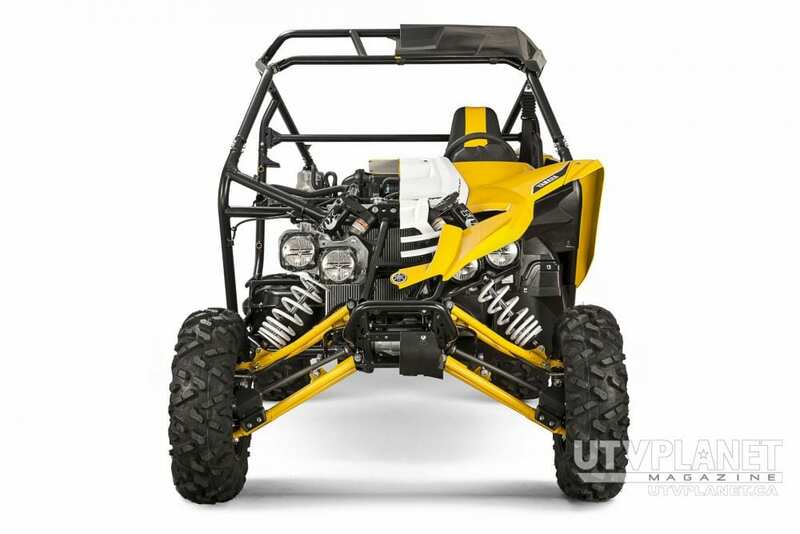 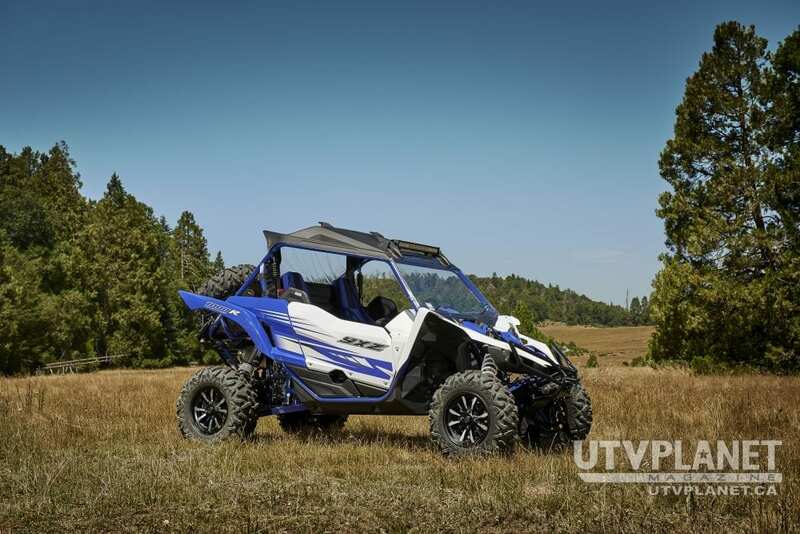 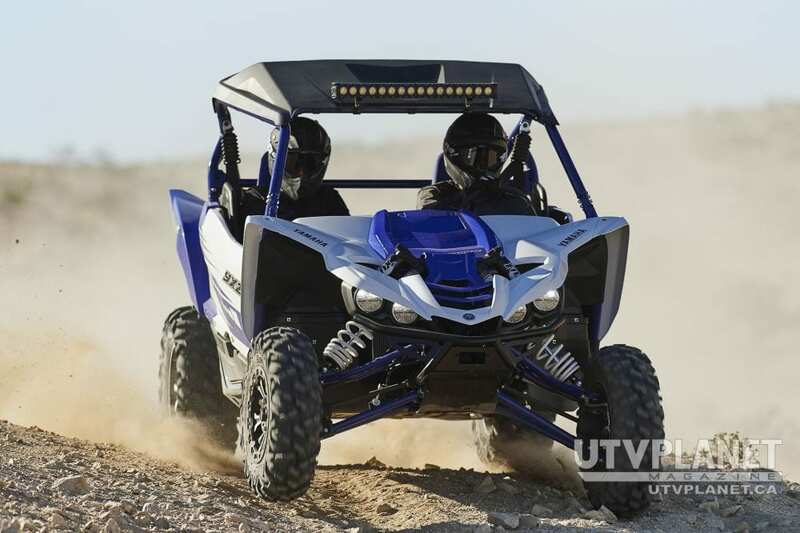 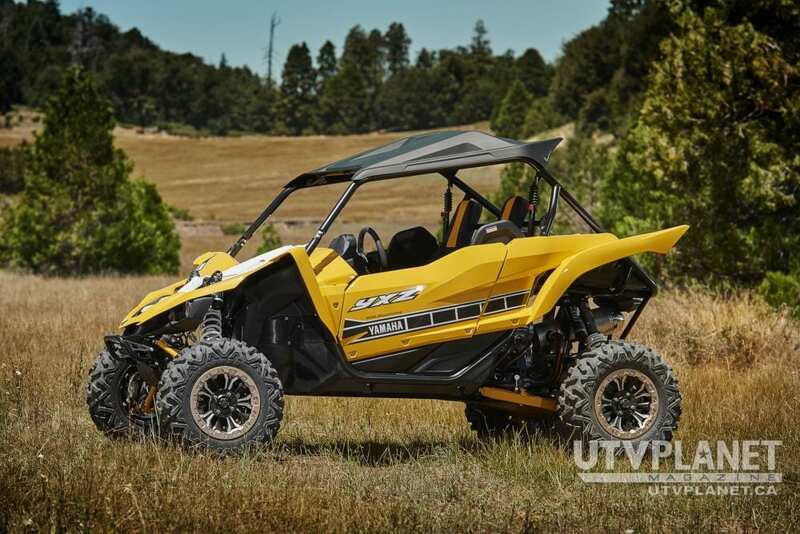 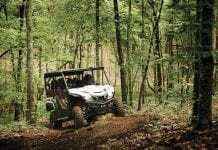 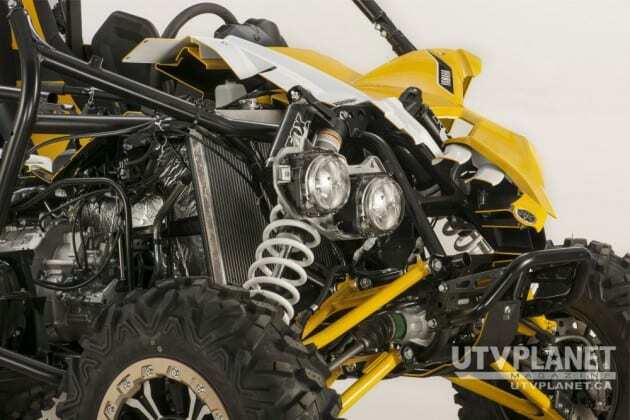 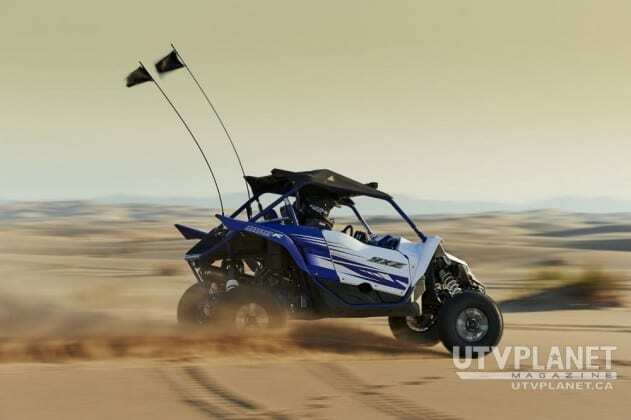 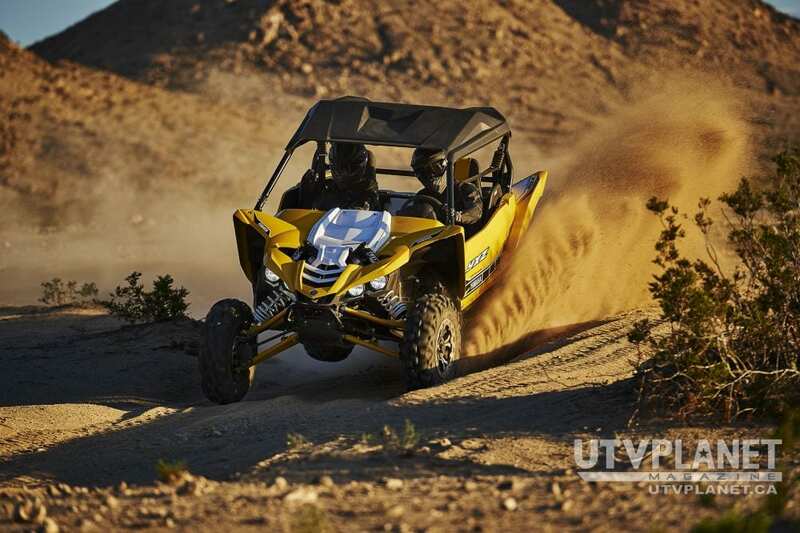 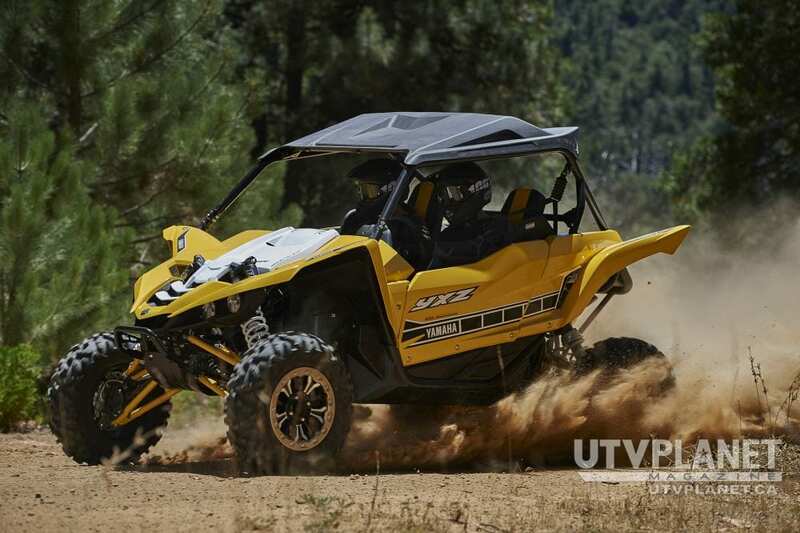 The YXZ1000R employs Yamaha’s proven Electric Power Steering (EPS). Set in a new, more compact and lightweight EPS unit, the optimized steering ratios provide precise handling through the best balance of assist and positive feedback from the terrain. This combination creates maximum comfort and confidence in rough off-road conditions. The steering wheel is located in an optimal position and features a steel armature, soft grip over-mold, and driver tilt adjustability for maximum cabin comfort, fit and feel. 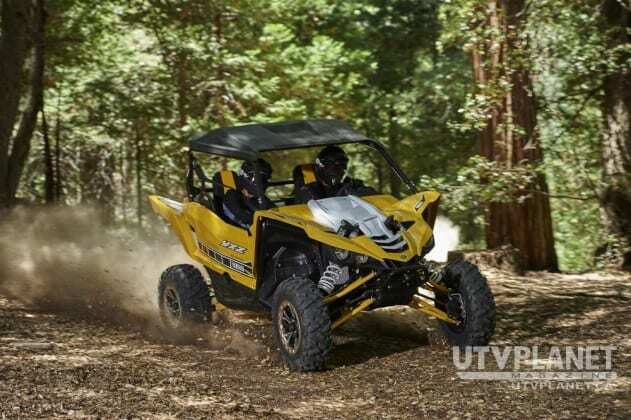 Critical for premium handling is strong, smooth and predictable stopping power, and the YXZ1000R accomplishes this by featuring four-wheel hydraulic disc brakes with twin piston calipers at all corners. 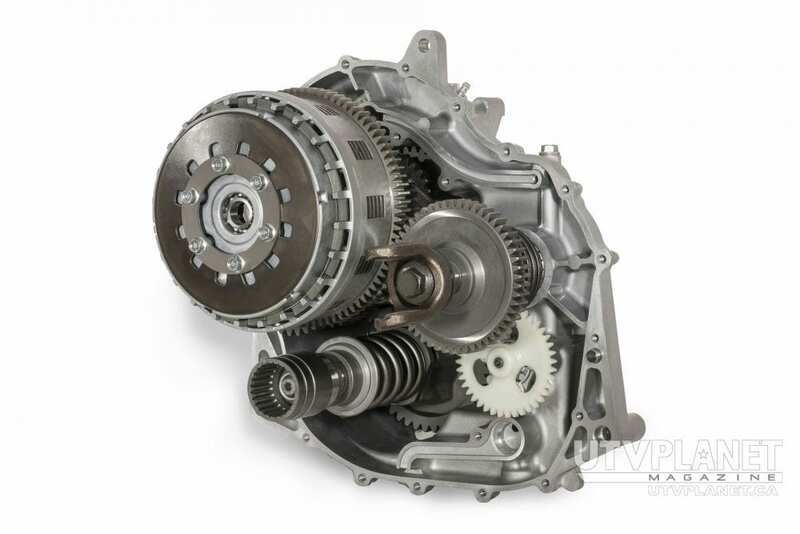 The resulting unmatched brake “feel” delivers added confidence during aggressive driving. Large 245mm rotors were adopted for enhanced cooling and reduced brake noise. The YXZ1000R boasts massive long travel FOX 2.5 Podium Shocks® with 16-inches of travel in front and 17-inches out back. 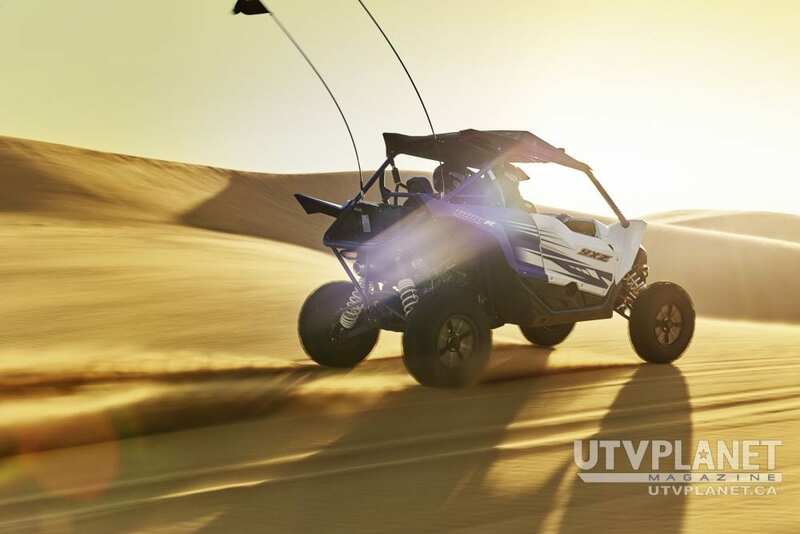 The piggyback reservoir shock absorbers provide top performance, confidence and comfort for driver and passenger. 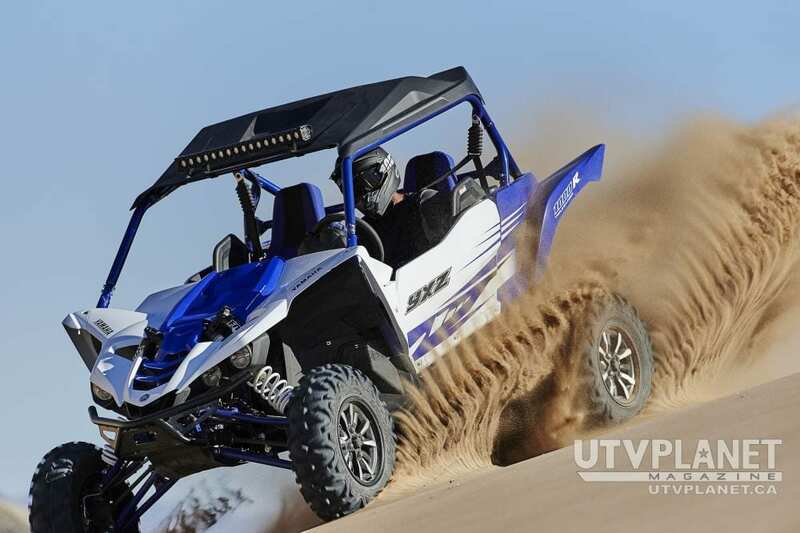 The YXZ1000R front suspension catches the eye as it protrudes upward through the hood of the vehicle, making their top end visible from outside and inside the cockpit, projecting an aggressive, defiant image. 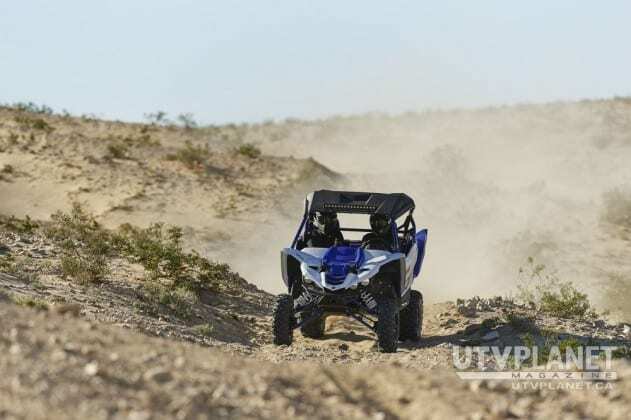 The fully adjustable front and rear FOX shocks feature adjustable hi- and low-speed compression, adjustable rebound, and adjustable preload settings. The rear shock utilizes a FOX Bottom Out Cup (BOC) technology that helps maintain ongoing comfort while reducing the chance for bottoming out in extreme conditions. 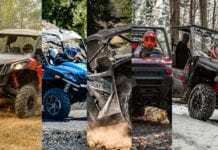 The vehicle’s color matched, rigid bushing pivot double A-arm design is uniquely configured and provides superior handling and a comfortable, confidence-inspiring planted feeling in tough terrain, over deep whoops, and throughout all-day off-road punishment. 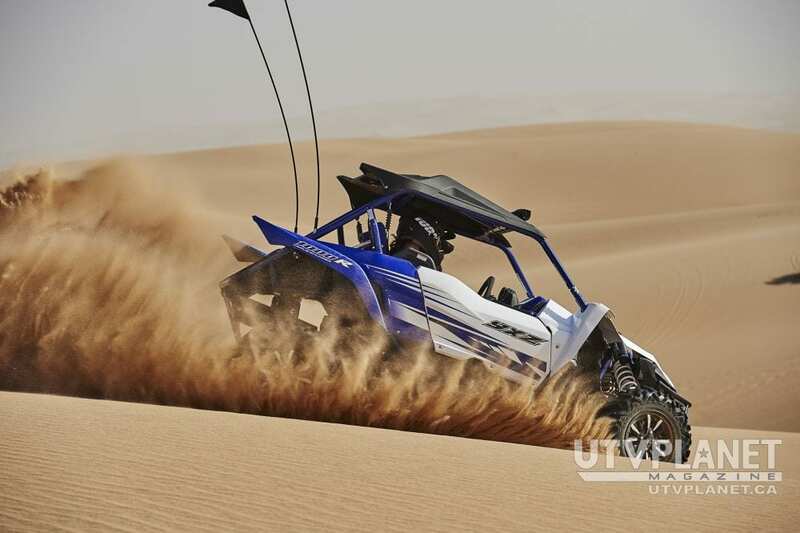 The front A-arms have optimized castor, bump steer and Ackerman – throughout the travel and steering angle – to achieve the best cornering ability and positive steering feedback with light effort. 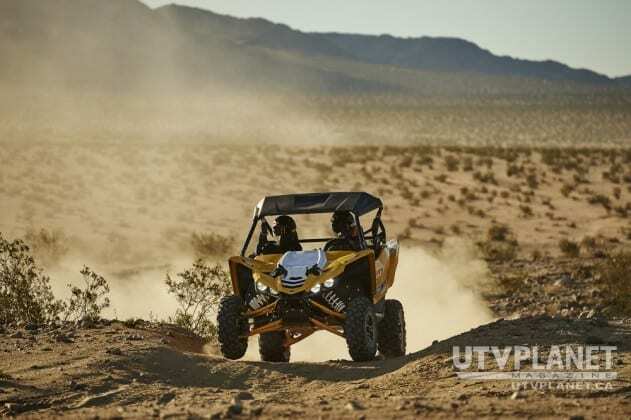 The rear double A-arm design is uniquely configured to provide superior handling and a comfortable, confidence-inspiring planted feeling. 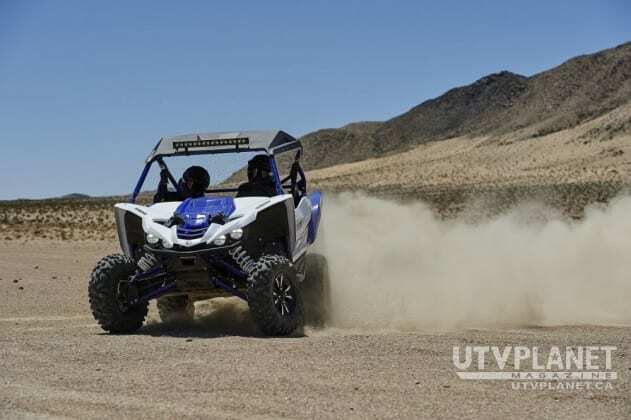 Spherical bearings ensure accurate tire alignment and the rear shocks are mounted as far out as possible, providing the longest and optimum stroke. The rear suspension design provides superior straight line stability with minimal camber variance throughout the entire range of travel. 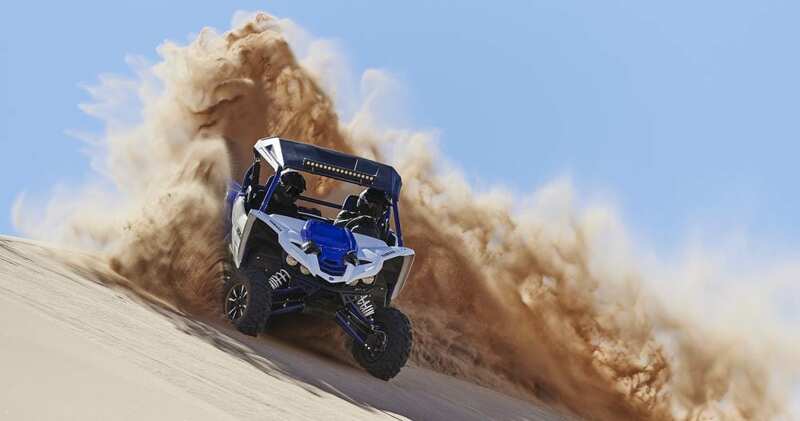 The YXZ1000R boasts all-new styling, embodying Yamaha’s passion for pure sport performance and the SxS enthusiasts’ independent, confident, and aggressive attitude. 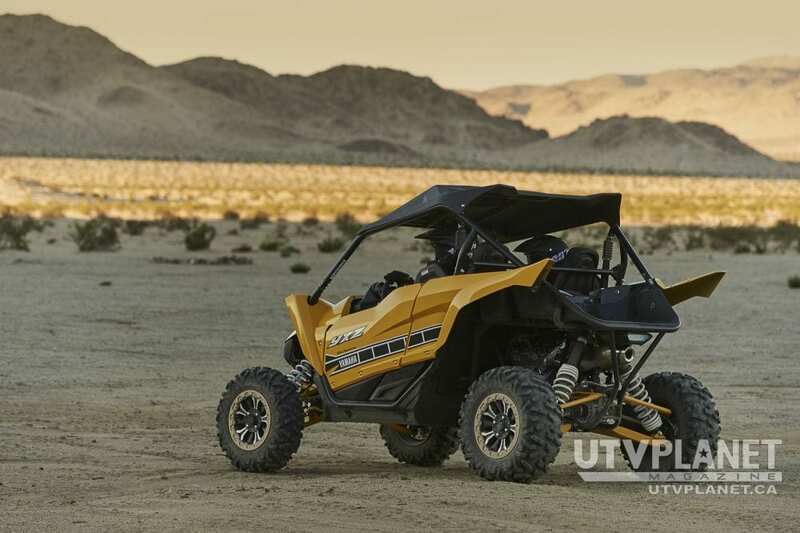 A sleek and nimble appearance plants the driver and passenger in the vehicle, creating a total man-machine integration and connection. The YXZ1000R features sharp lines and angles, jaw-dropping suspension projecting through the vehicle’s hood, and stylized wheels and tires. 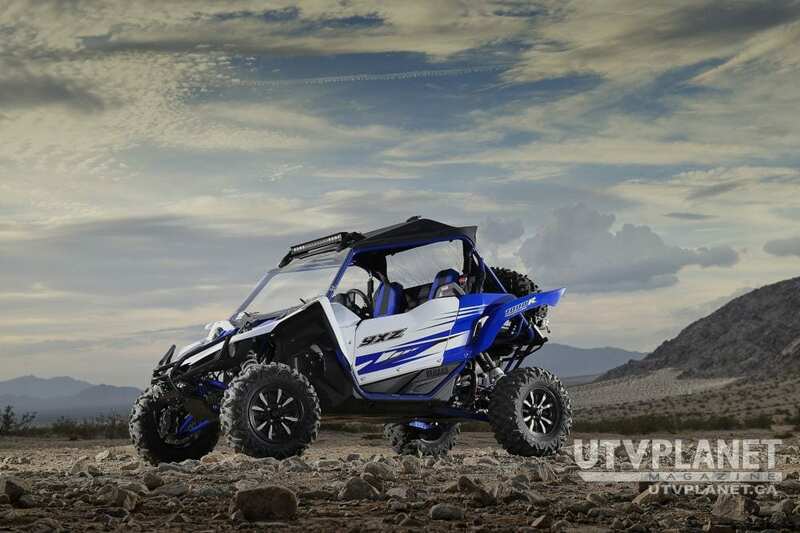 The front fender gets a unique and aggressive look complementing the vehicle’s overall high-performance styling and enhanced visibility, and showcasing its massive front suspension. 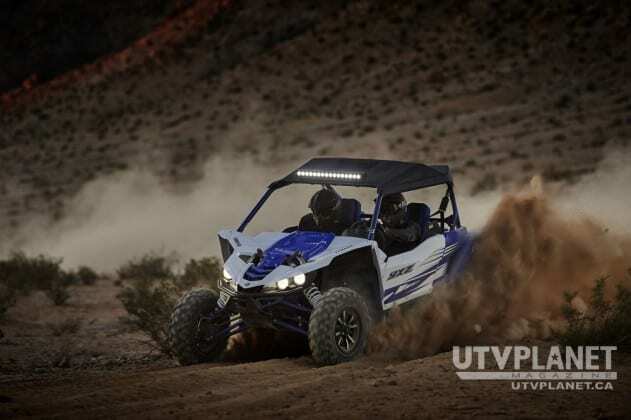 The newly designed front grill and carry bar continue the aggressive theme outlining the ominous four-eyed LED headlight system for high-performance illumination. 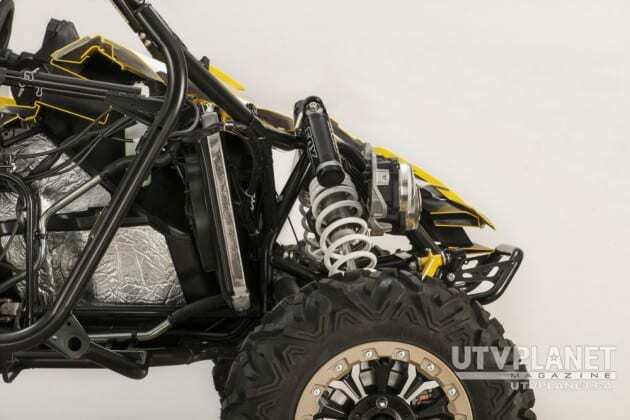 The rear fender features a unique, durable and functional design, also with an aggressive, compact look and an efficient, highly visible LED taillight. 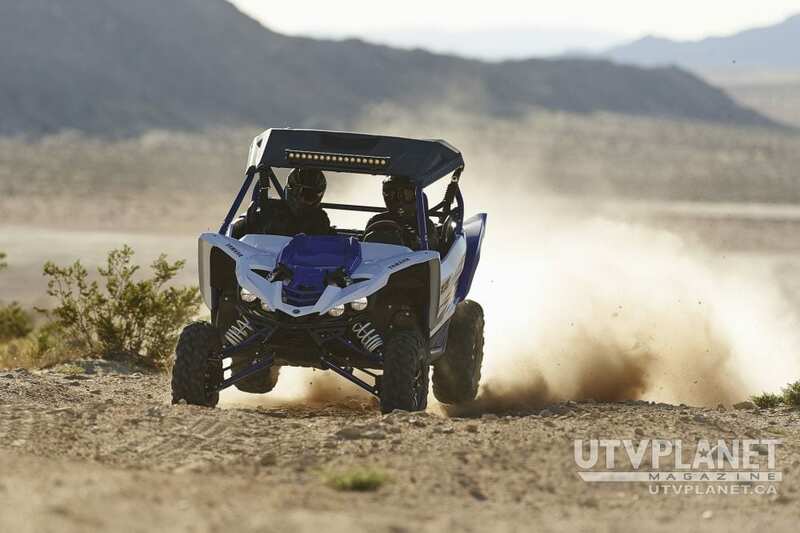 The lightweight and durable cargo bed provides the best combination of function and durability for high-performance sport SxS performance. 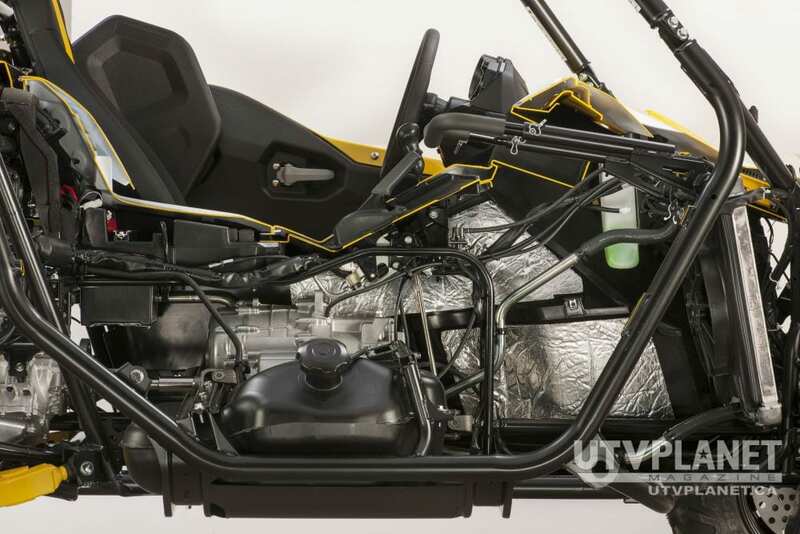 The fixed position bed is rated to carry up to 300 pounds and features a water resistant sealed storage compartment, plus four steel tie-down points welded to the frame for strong and secure storage. 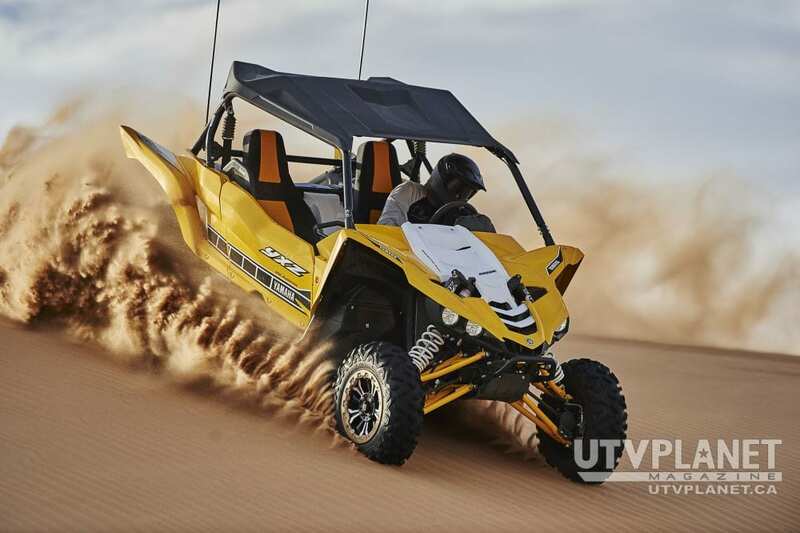 The standard YXZ1000R sun top has sharp styling and is seamlessly integrated into the chassis, complementing the entire design. All-new color-matched doors incorporate inset handles that are convenient, durable and easy to operate with two-stage automotive style latches and coil style door return springs. 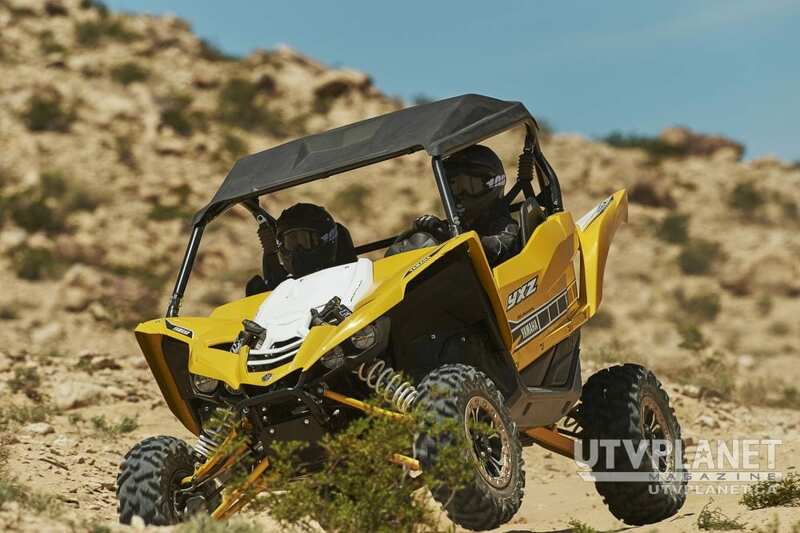 The YXZ1000R’s sporty two-seat chassis features a cockpit-like cab with comfortable and convenient ergonomics, plush contoured high-back, cut-and-stitch seats, sliding adjustable driver’s seat, and a soft-grip, tilt adjustable steering wheel with 147mm of vertical travel. 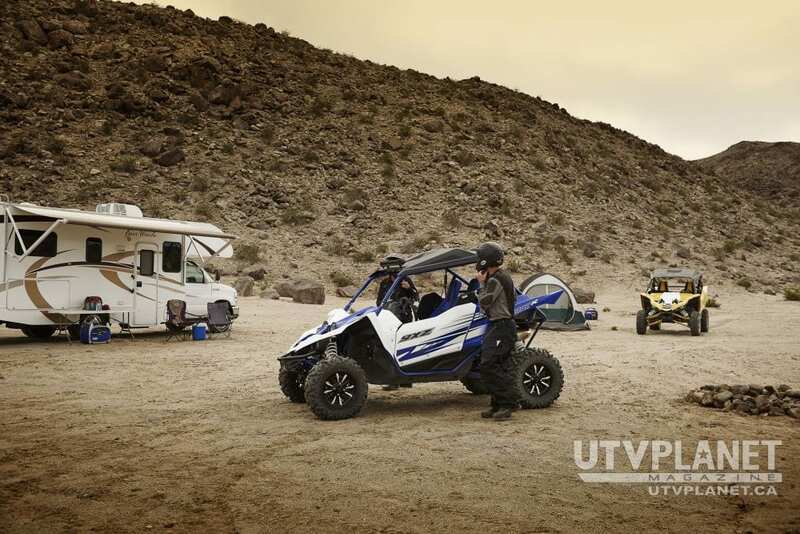 The cabin allows for quick and easy access to functional items for both the driver and passenger. 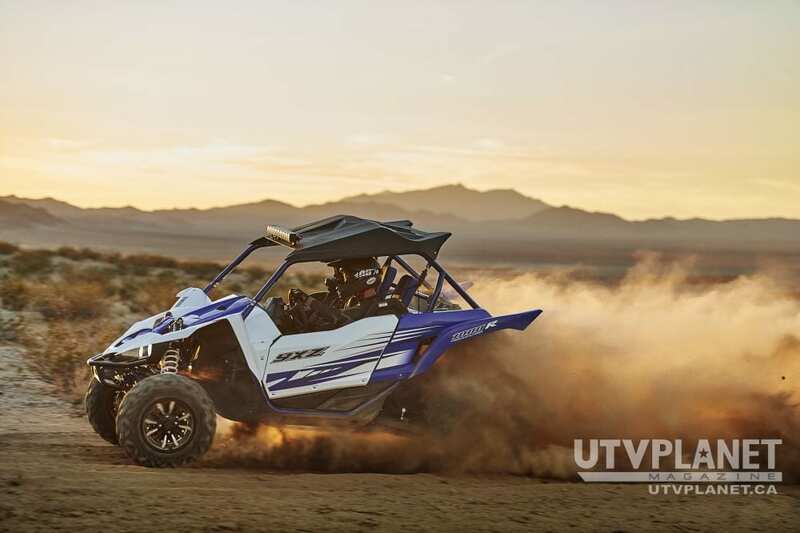 A first for the sport SxS segment, the YXZ1000R features throttle, brake, and clutch pedals for true sport driving performance. 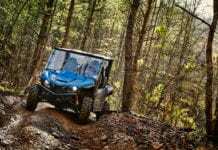 The vehicle’s floorboards are positioned for maximum legroom, while maintaining a planted feeling in tough terrain, with dedicated closed-in floorboards for both driver and passenger. 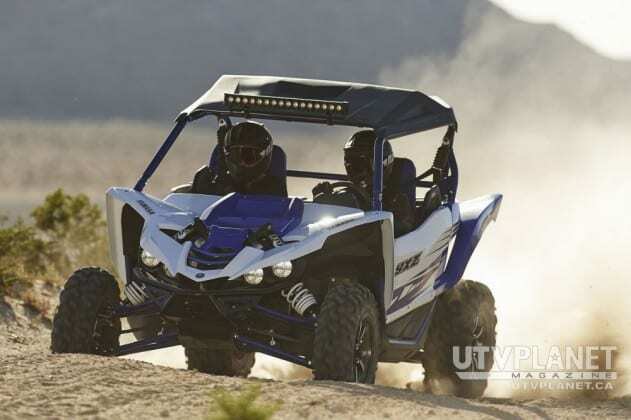 Three-point seat belts, integrated shoulder bolsters and passenger hand-holds provide optimal support and occupant comfort, while the driver’s side features a new and durable 8 position (90mm) adjustable seat that smoothly slides by a convenient lever, quickly locking into the preferred location without any tools necessary. 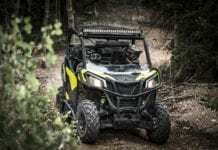 The YXZ1000R dash layout balances functional features with intuitive ergonomics for both driver and passenger. A hybrid digital-analog multi-function meter features speedometer, tachometer and shift light, providing critical information with sport-inspired styling. 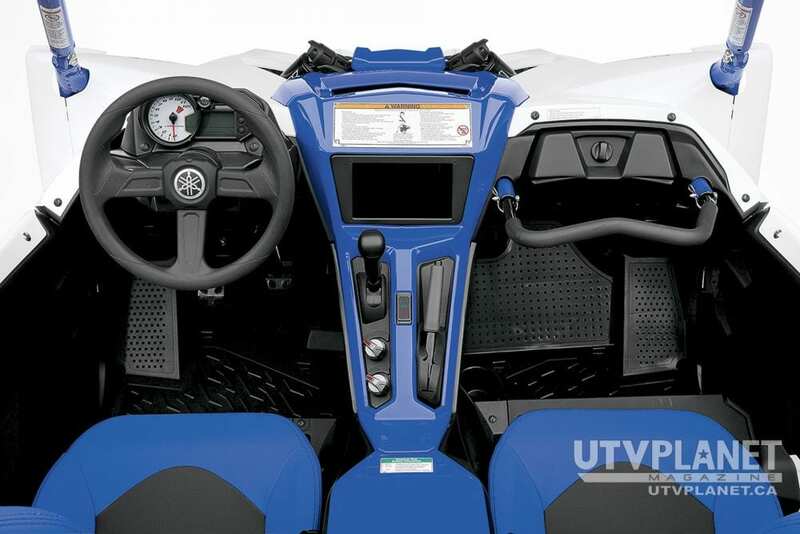 The center console incorporates a parking brake handle, headlight switch, On-Command® dial, and the all-new sequential manual shift lever. A convenient center storage tray and passenger-side latching glove box offer quick and secure storage options, while a center-mounted 12V outlet powers accessories and personal items. 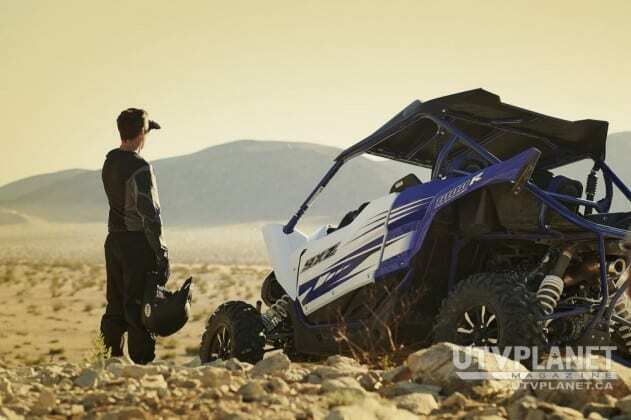 Yamaha SxS vehicles are known to be the most durable and off-road capable, and the YXZ1000R continues that tradition bringing an all-new level of reliability to the sport SxS segment. The YXZ1000R’s all-new sport-inspired frame was built to provide the industry’s most durable and reliable performance with nimble handling and a comfortable, secure-feeling pure sport SxS experience. 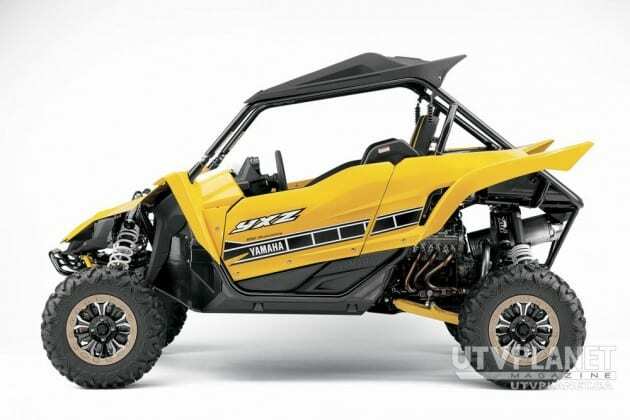 Its optimized frame dimensions result in the best handling sport SxS ever. 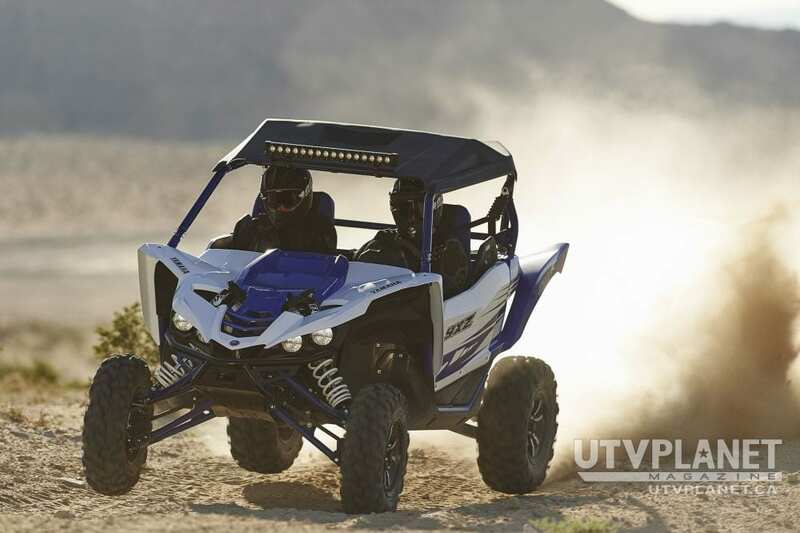 Full underframe protection covers the bottom of the vehicle from front-to-back and side-to-side while still incorporating easy access to service points. 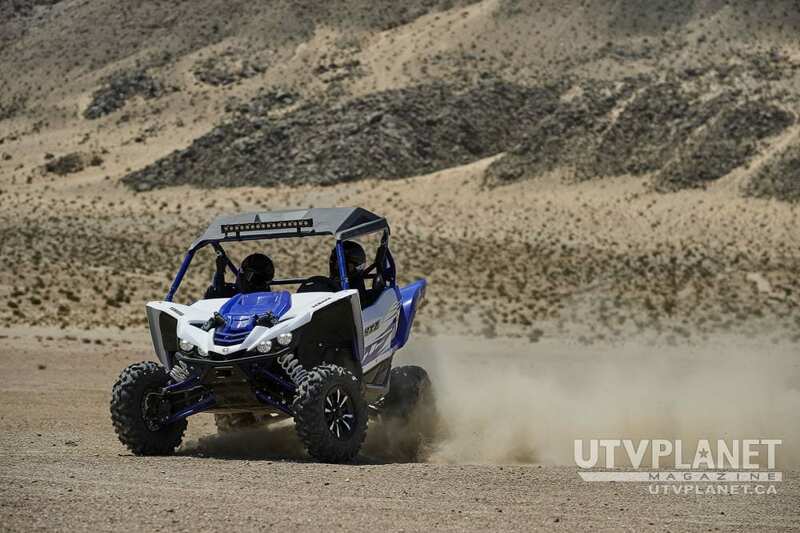 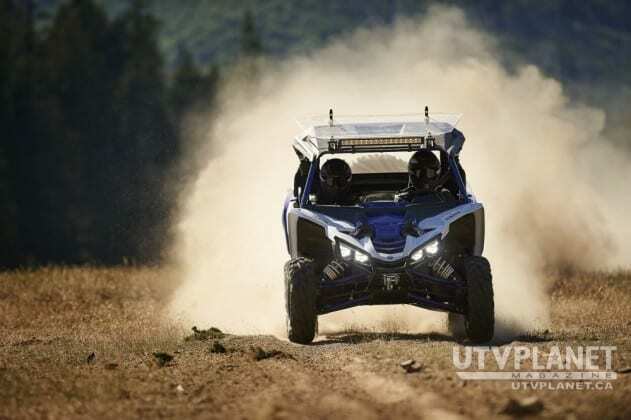 Yamaha employed lightweight and extremely durable Thermoplastic Olefin to provide the best impact resistance, flexibility and wear reduction, while also allowing the vehicle to easily glide over obstacles encountered on the trail. The YXZ1000R features Yamaha-exclusive 27-inch Maxxis Bighorn 2.0 radial tires with standard 14-inch cast aluminum wheels, providing the best combination of styling, durability, ground clearance and handling. 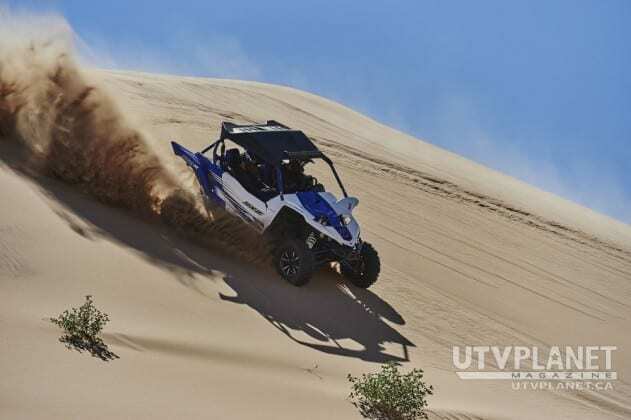 The tires’ 6-ply radial construction allows for optimum traction, durability, comfort and steering precision, and the standard 14-inch cast aluminum rims have a unique, durable and functional design. The all-new YXZ1000R SE Yellow and Black 60th anniversary edition with bead lock rims will be in Canadian dealer showrooms in October, with an MSRP of $26,149 CDN. 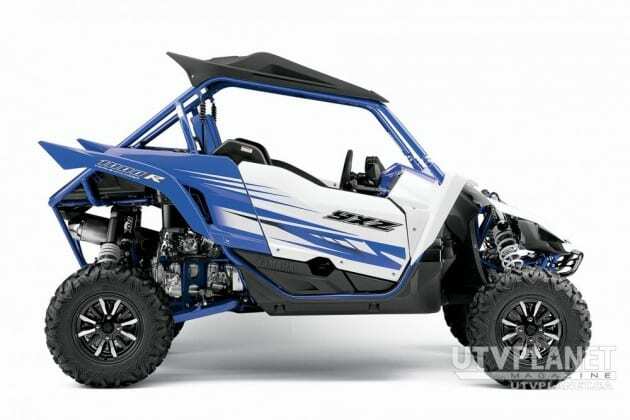 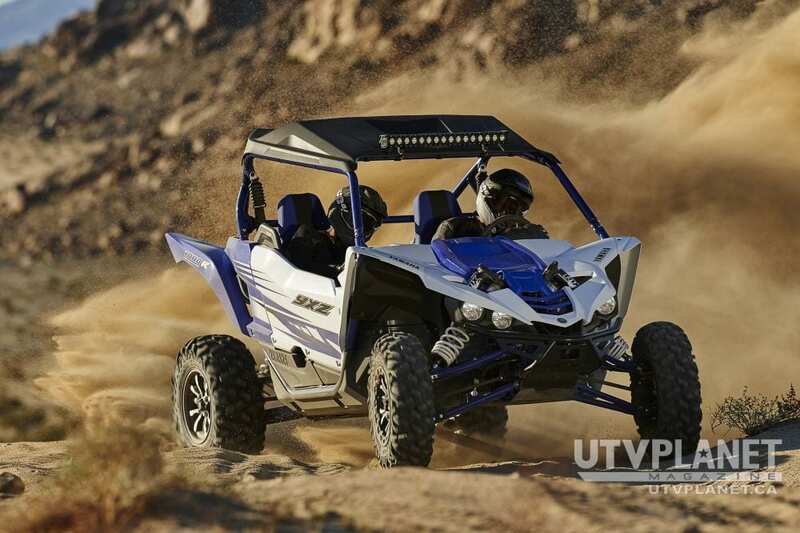 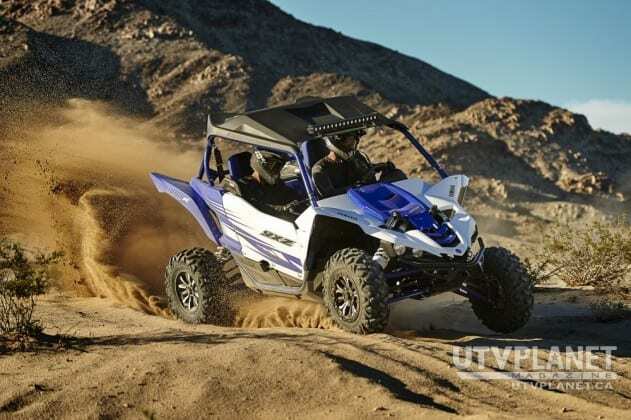 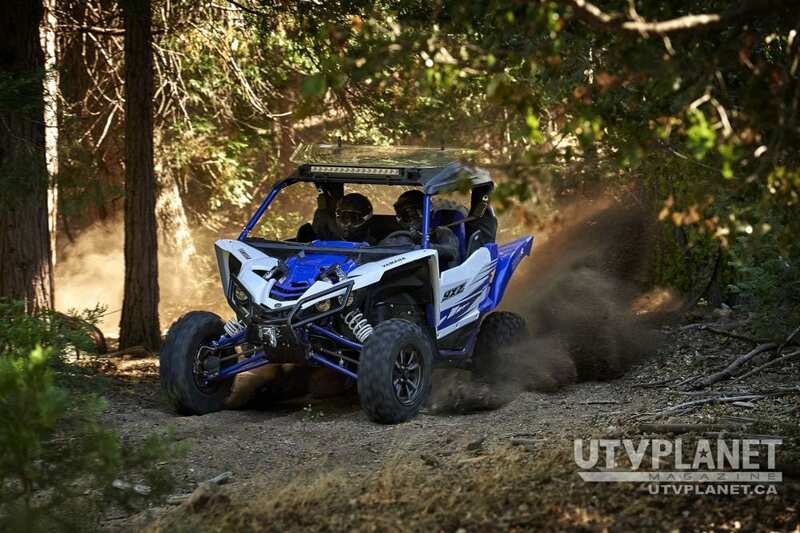 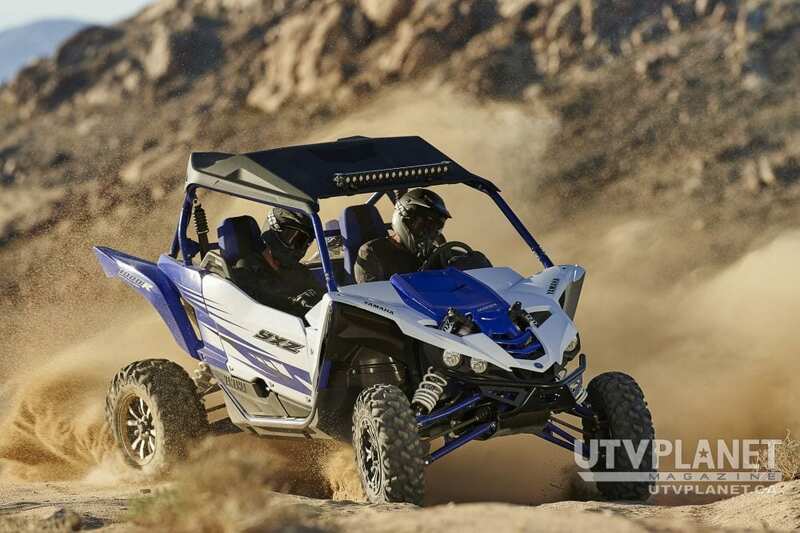 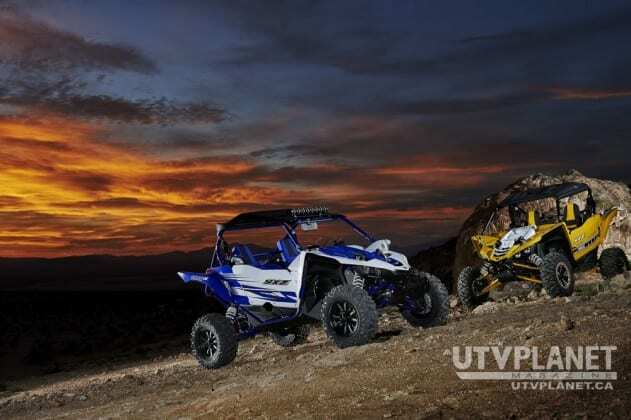 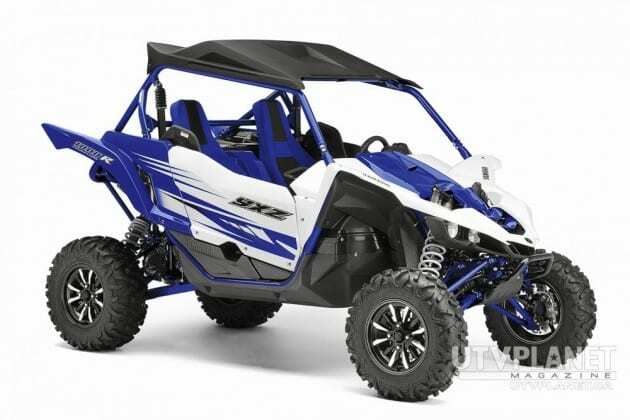 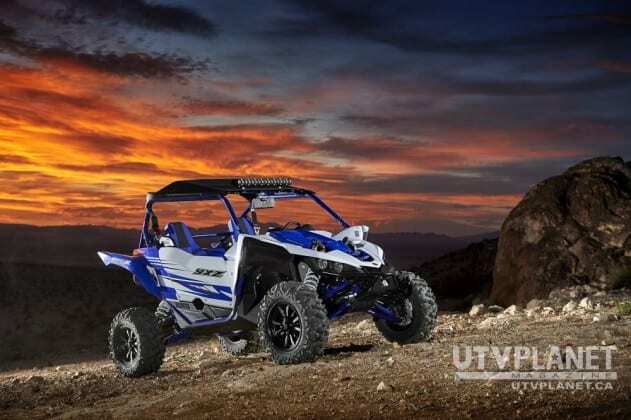 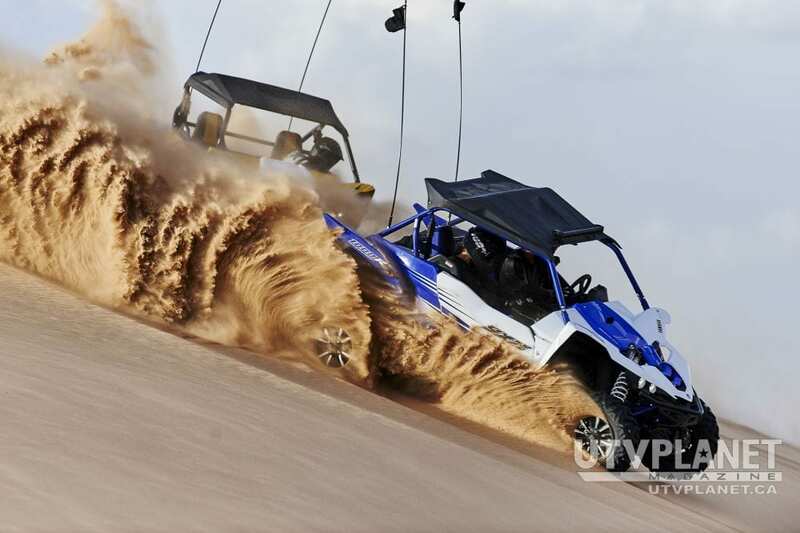 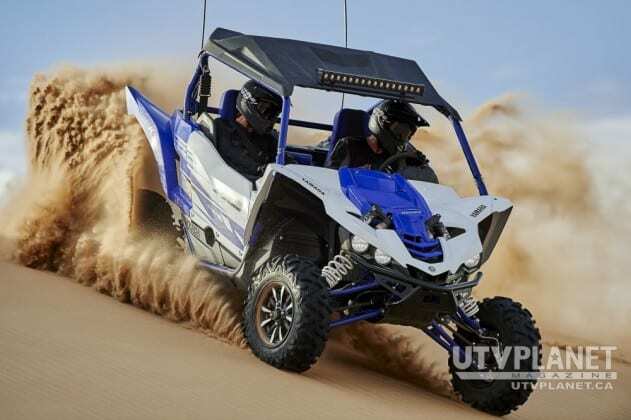 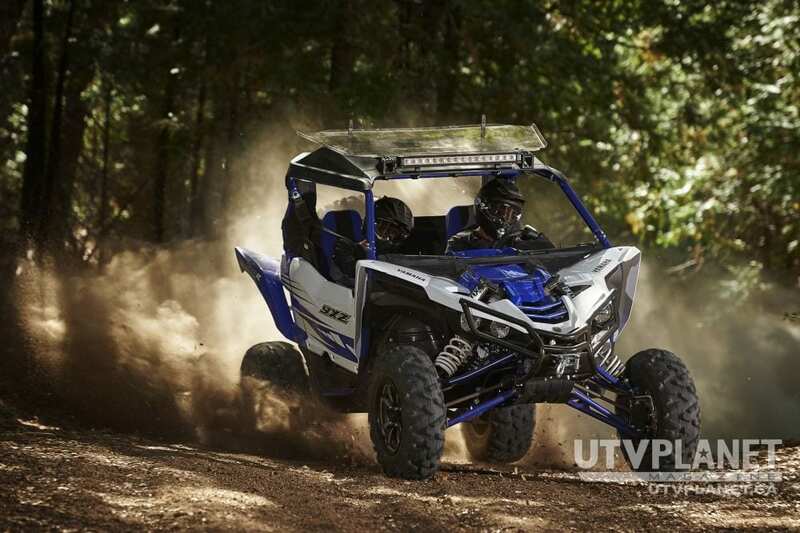 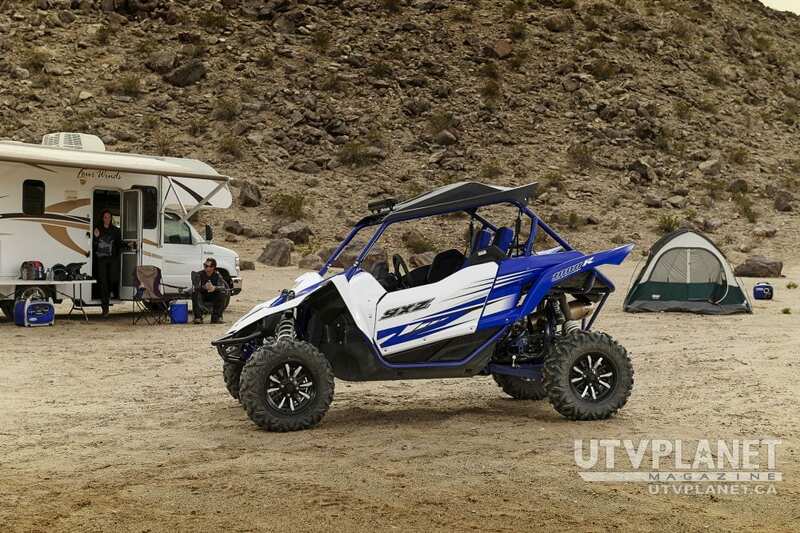 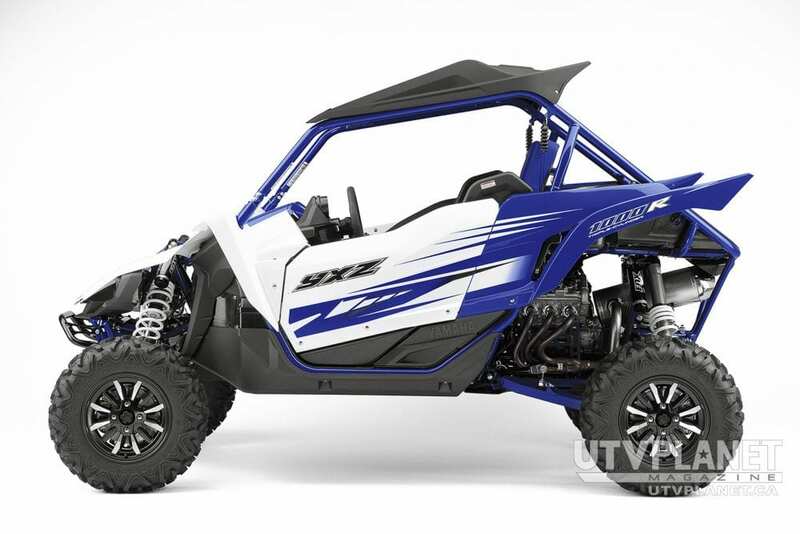 Pricing for the blue and white YXZ1000R model is yet to be determined and will not be available until February. 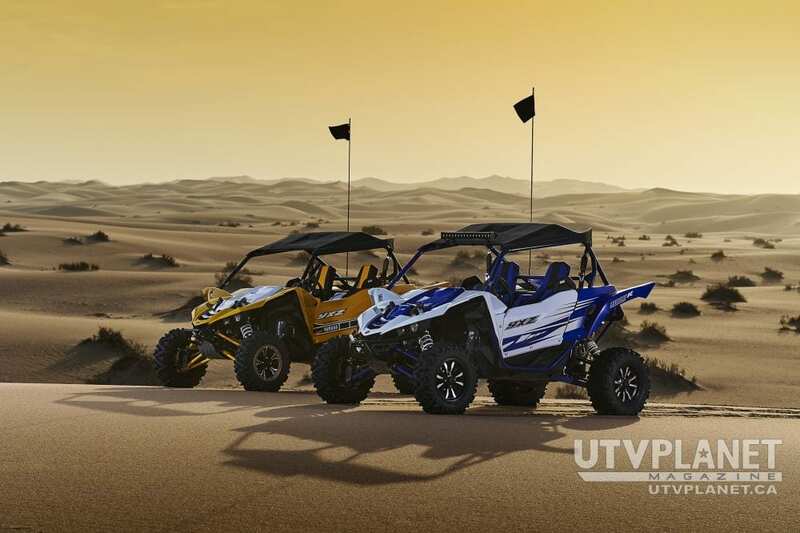 Canadian colour options are limited to the two aforementioned models.